Emperors’ stamps once symbolized highly centralized power. Almost all were made of nephrite jade, chosen for its unequaled rarity, durability, and beauty. They’re no longer in use, but today many of China’s organizations use nephrite stamps to depict major events. This is the official stamp of the 2010 Shanghai World Expo. 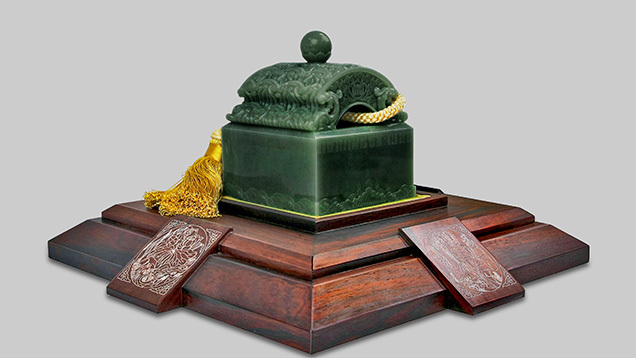 It’s made of a piece of top-quality light green nephrite weighing 4.28 kilograms (about 9 lbs.). It was carved by Master Zhang Tiecheng to mimic the style of the stamp used by Emperor Qianlong, historically known as jade’s biggest fan. Courtesy of China Gems magazine. The Chinese character “Yu” is equivalent to the English term “jade,” but the term’s meaning has broadened to include both nephrite and jadeite jade. Some even use the word to refer to all beautiful rocks, demonstrating the significance of jade in the Chinese culture. Record-setting prices for jadeite jade jewelry have been in the industry news spotlight for the past 30 years. However, nephrite jade has been an important part of China’s jade culture for more than 5,000 years. And nephrite’s history on other continents goes back 4,000 to 5,000 years. The name jade had always applied to nephrite until jadeite jade was imported into China about 200 to 250 years ago. In China, jade symbolizes a connection between the living and the dead as well as power, wealth, and social class. Also used to fashion tools, jade is a part of every aspect of people’s lives. To display their pride in jade culture, the Chinese mounted nephrite jade into the award medals used in the 2008 Beijing Olympic Games. It was the first time that gem materials were used on Olympic medals and it reignited an awareness of, and love for, nephrite jade. 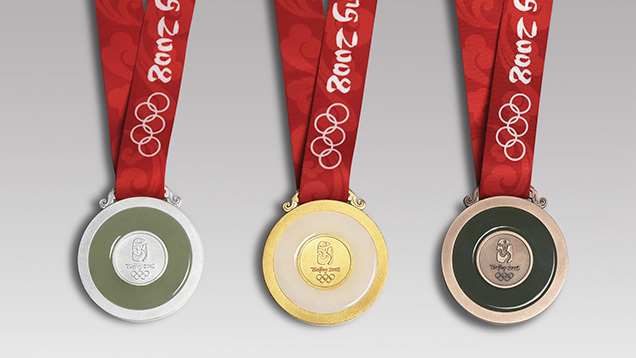 The Beijing Olympics medals were mounted with nephrite sourced in Qinghai province, China. It was a highly successful promotion that drove up sales and facilitated the nephrite jade rush in Canada and Russia that occurred in 2009 and 2010. Courtesy China Gems Magazine. In China, nephrite names are based on color. White nephrite has always been and still is the most highly revered. 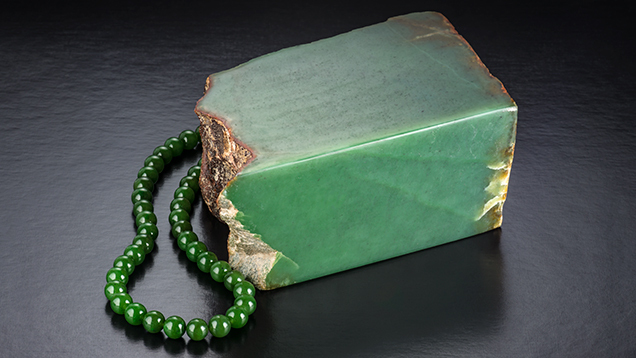 Owning a piece of white, or “mutton fat,” nephrite is the dream of all jade collectors. Next on the popularity list is green nephrite. It has the same hue as the most valuable jadeite jade but it’s not as bright. The slightly weaker luster gives it a more conservative look. Green nephrite has attracted consumer attention due to the recently skyrocketing prices of white nephrite and good-quality jadeite jade. The “Ban Zhi” ring was once worn on a man’s thumb and designed with a very thick shank to protect the skin during archery practice. It later evolved into a symbol of wealth and power. This one is attached to a beaded string for hanging on a belt. Courtesy Beijing Boguan Auction House. While very few people question China’s status as the largest nephrite jade market, the sourcing, manufacturing, and trading of the stone have never stopped evolving. Today, nephrite holds an exalted place in the Chinese market, motivating Canadian and Russian miners. Since Chinese green nephrite production keeps shrinking, the main products on the market are from these two sources. History, production, and trading policies, and the demand from China, combine to influence the modern green nephrite market. Green nephrite occurs along the contacts between serpentinite units and more silicic (rich in silica) rocks such as granitic intrusive bodies, argillite, chert, or greywacke in obduction settings, where continental and oceanic crusts collide (Harlow at al., 2005). Its formation results from metasomatic reactions promoted by the presence of calcium-rich hydrous fluid along the contacts (Harlow et al., 2005). Although deposits around the globe share a similar geological setting, there is no single formation model. Since serpentinite belongs to ophiolite belts and ophiolite is of oceanic origin, it’s only transported to land by subduction or obduction. Subduction and obduction occur during continental-oceanic collisions, so most ophiolite belts occur along old suture zones and current subduction zones. 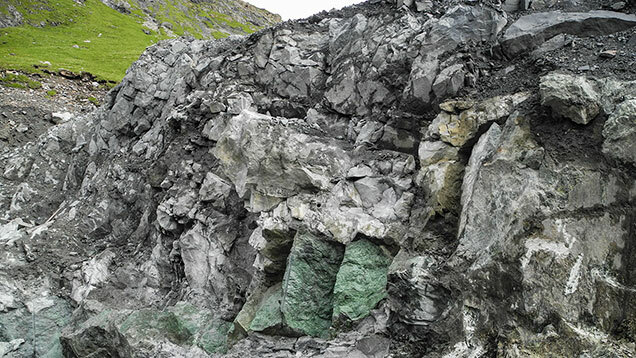 Major green nephrite deposits form within serpentinite belts along old or still-active subduction zones. The three most commercially important deposits—in China, British Columbia, and Siberia—all have similar geological environments. Map adapted from Harlow and Sorensen, 2005. 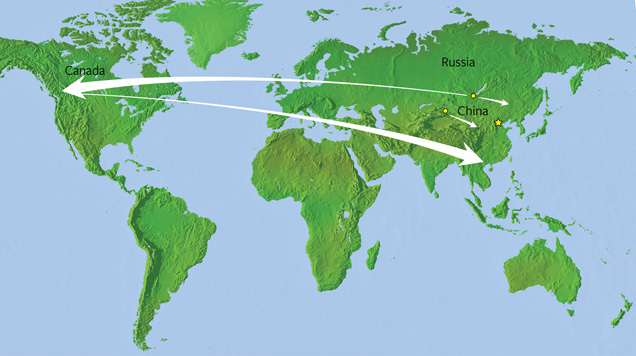 The most economically important green nephrite sources are located in northwestern China, British Columbia, and Siberia. They are all major suppliers for the China market. 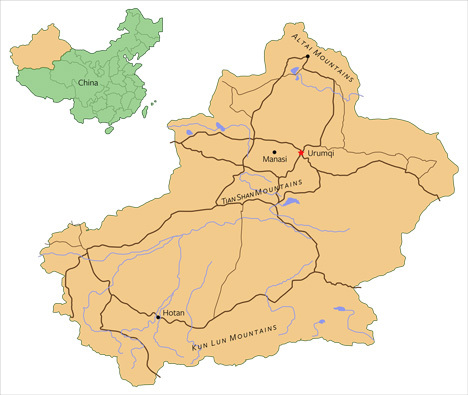 Hetian, also known as Hotan, is located in northwestern China (Xinjiang Uygur Autonomous Region) and has always been synonymous with the best nephrite. The area is known for yielding the famous top-quality white “mutton fat” jade. Traditionally named “Hetian Jade” is mainly from the Kunlun (Karakoram) and A’erjin (Altai) Mountains. Most of the production from these two areas is white, light greenish white, or light green. Nephrite with a very obvious green hue is called “green nephrite” (“Bi Yu” in Chinese). Most green jade production is from the Manasi River Valley in the south of Jungar Basin. 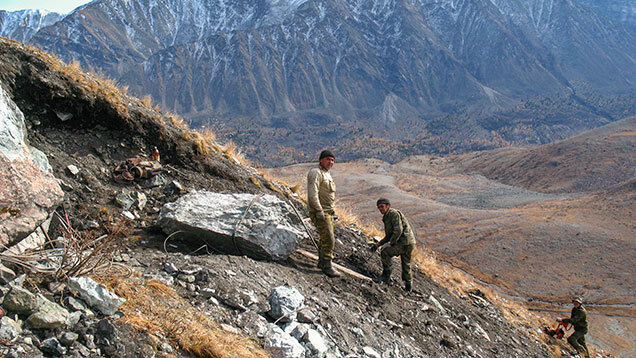 Primary deposits are located on the north slope of the Tian Shan (or Tien Shan) Mountains. In the trade it is called “Manasi green jade. The mining of Manasi green nephrite has a long history. During the Qing dynasty, it was completely controlled by the imperial court. 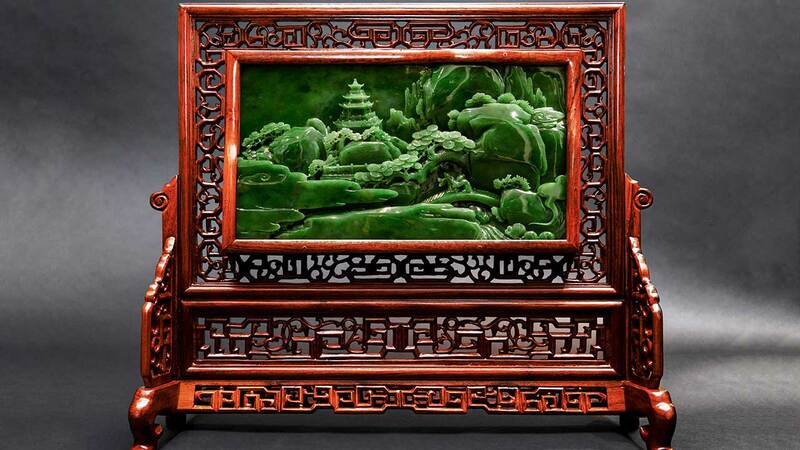 In 1789, Emperor Qianlong ordered the closing of the area’s green nephrite mines. After that, the mines were dormant for more than 180 years. In 1973, the topic of green nephrite resources and mining was raised in a national meeting. This facilitated the reopening of the old mines and exploration in search of new resources. Local government support led to the establishment of a nephrite carving factory in Manasi County in 1974. That year, green nephrite production reached several tens of tons. The rough was transported to carving factories in southern China. Finished products mainly supplied the domestic market. 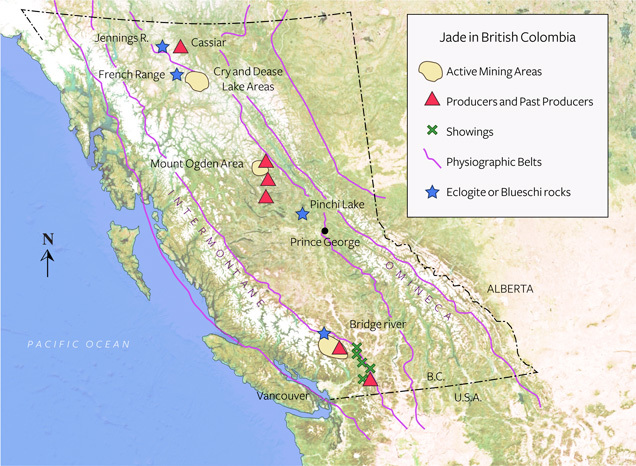 There are more than 50 nephrite occurrences in British Columbia (Simandl et al., 2000 ogden mine article), all distributed along the Cordilleran belt that extends from Alaska to California at irregular intervals along the continent’s margins (Leaming, 1995). This belt includes different regions of oceanic origin that contain the rocks necessary for green nephrite formation. These regions became part of the continent during subduction that occurred in the Mesozoic (Davis et al., 1978). 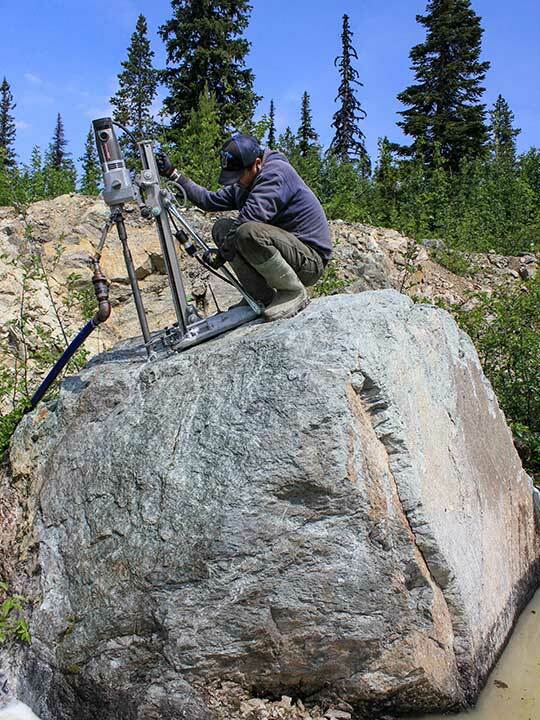 Nephrite deposits are distributed along a belt of ultramafic (igneous, with very low silica content) rocks that extends over 1,000 miles from the Canada-US border northwest through central and northern British Columbia, all the way to the Yukon border. Three clusters of nephrite deposits formed along this belt: southern, central, and northern clusters. Until the 1960s, almost all of the nephrite produced in British Columbia came from secondary deposits. 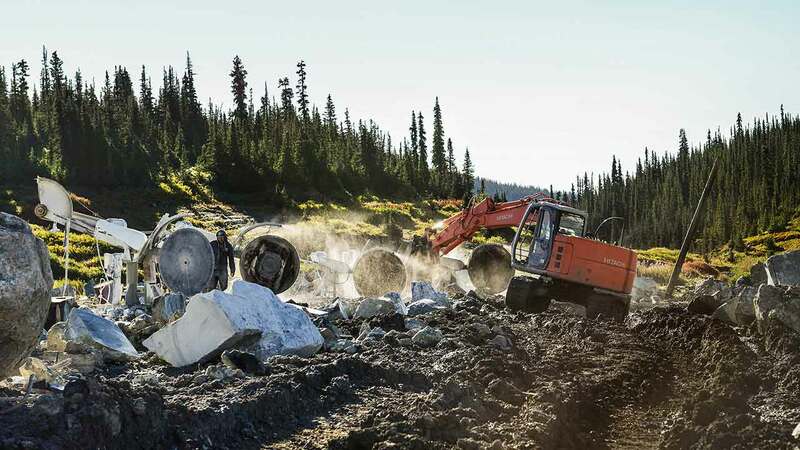 With the rapid expansion of amateur lapidary activity after World War II, production in British Columbia’s jade fields picked up and they became the most important suppliers. About the same time, markets opened up in Germany and the Orient. Mining activity gradually depleted the secondary deposits, but increasing values led to further exploration. These efforts uncovered primary deposits adjacent to the Fraser River area in southern British Columbia, the Mount Ogden area in central British Columbia, and the Cassiar jade fields in the far north. Today, British Columbia is the main supplier for the China market. 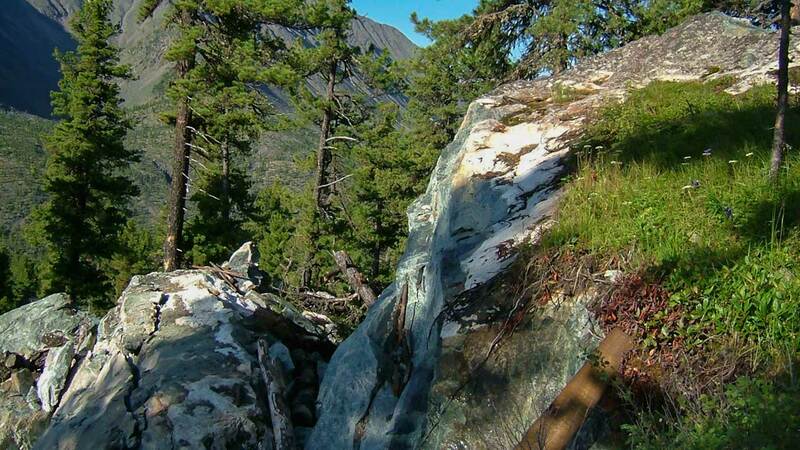 The primary nephrite deposits in British Columbia are all located in highly mountainous areas. This is a view of the Jade Mountains in the province’s northwest corner. 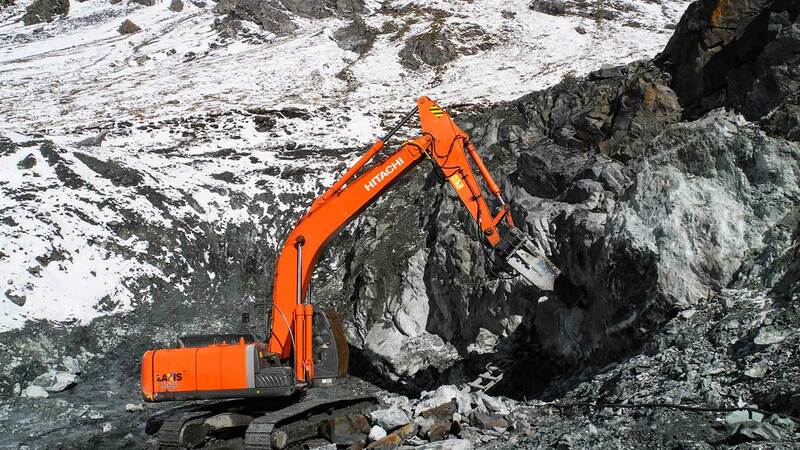 The extremely rugged terrain and harsh winters make nephrite mining very challenging. Courtesy of Jade West Group. 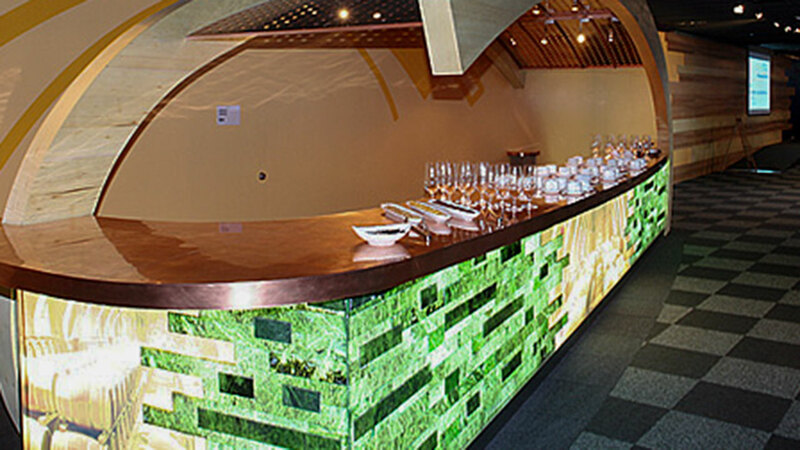 Jade West Group, founded in 1981, is the biggest player in green nephrite mining and trading in British Columbia. Kirk Makepeace, the company’s founder, is an avid promoter of the stone. 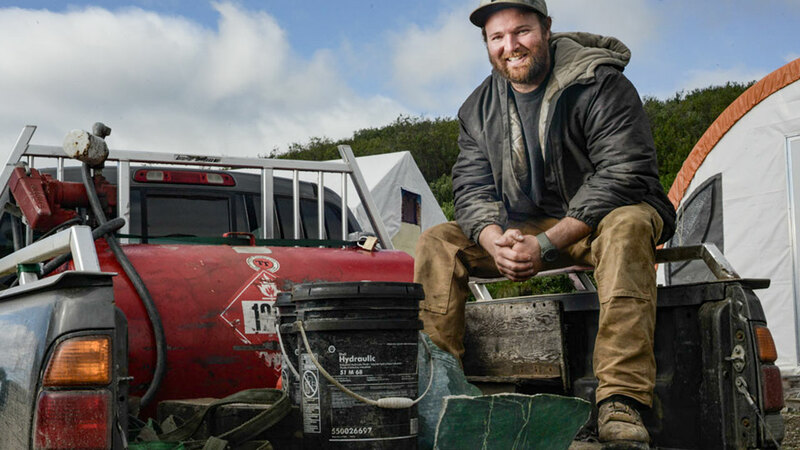 He started with a summer job as a jade driller. This involved flying into remote areas and spending summers in tents, with supplies brought by small planes every two weeks. Carrying drills in a backpack, he hiked the countryside in search of jade boulders. He drilled cores from them to determine potential quality. About three out of 100 boulders he drilled were of marketable quality. More than thirty years later, Jade West has become one of the world’s leading producers and exporters of green nephrite jade. 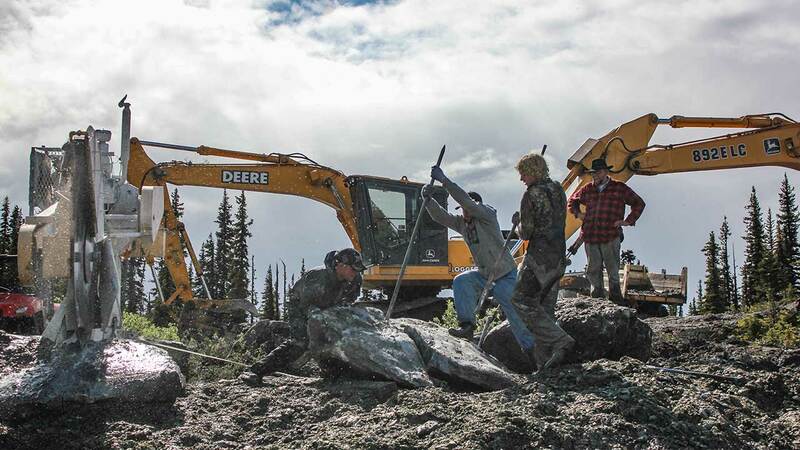 The company owns and operates three out of the four active nephrite mines in British Columbia, including the famous Polar Mine near Dease Lake, and the Kutcho and Ogden Mountain mines. The Polar Mine’s high-quality production is known as Polar Jade in the trade. 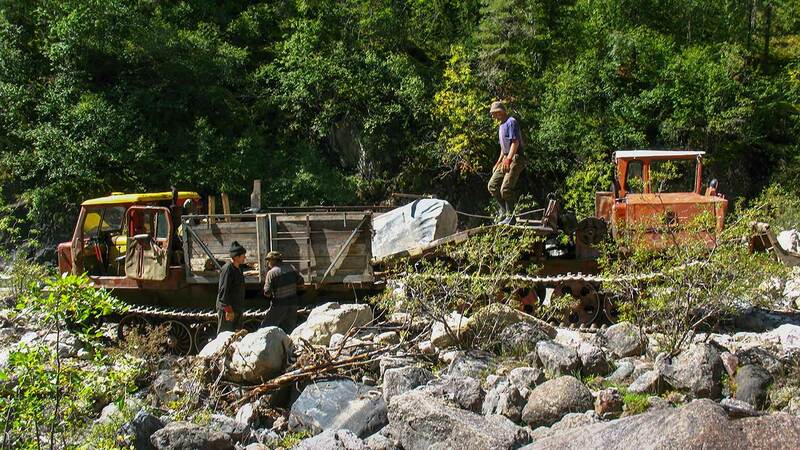 Secondary deposits have been exhausted, so nephrite mining in British Columbia is now mainly mechanized. Costs are high, but the richness of the deposits still makes it a very rewarding business. Courtesy of Jade West Group. 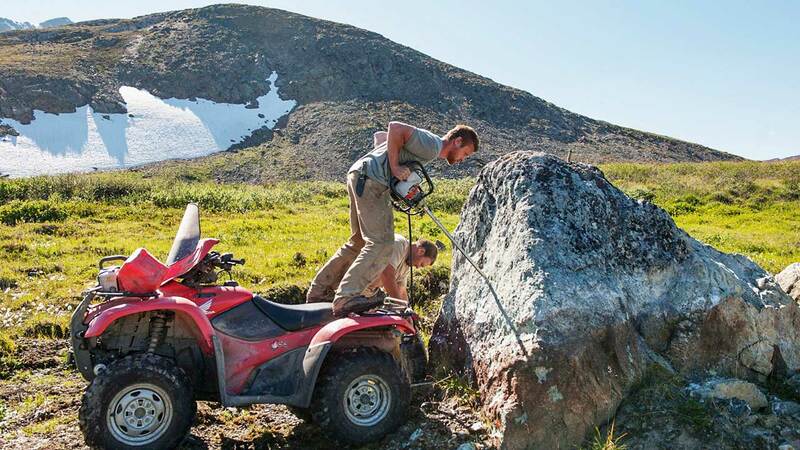 The Polar Pride boulder—called “the find of the millennium” by trade experts—was discovered in 2000. The 18-ton boulder was split in half for carving. Courtesy of Jade West Group. 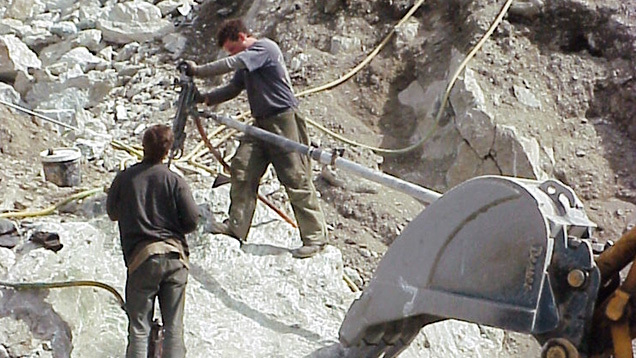 Nephrite mining in British Columbia is very challenging. Winters are long and harshly cold, and deposits are remote, so mining can only happen during the short summer season, about 60 days a year. Almost all of the secondary deposits are exhausted, so current mining is almost all from primary deposits. 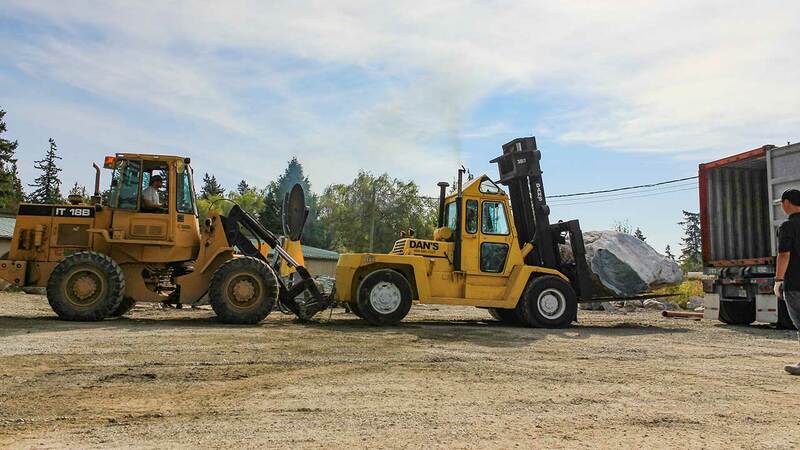 Transporting the heavy equipment to the mining sites is backbreaking work. 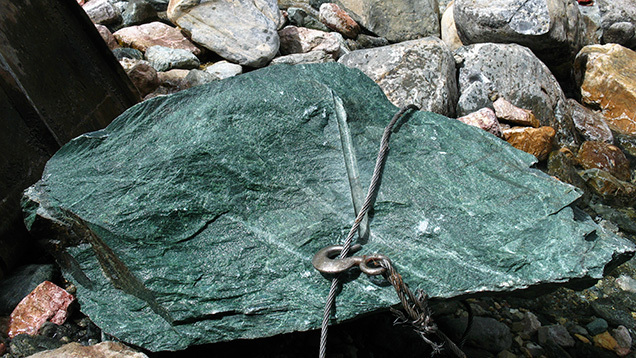 Jade West uses diamond-coated circular and wire saws and modern high-pressure hydraulic splitters to remove the nephrite from the mountain and saw it into pieces of a manageable size. Nephrite’s excellent toughness makes it extremely difficult to break out of the rock. While blasting had been used in the past, Jade West no longer uses explosives. Nephrite deposits range from 12 inches to 12 feet wide. 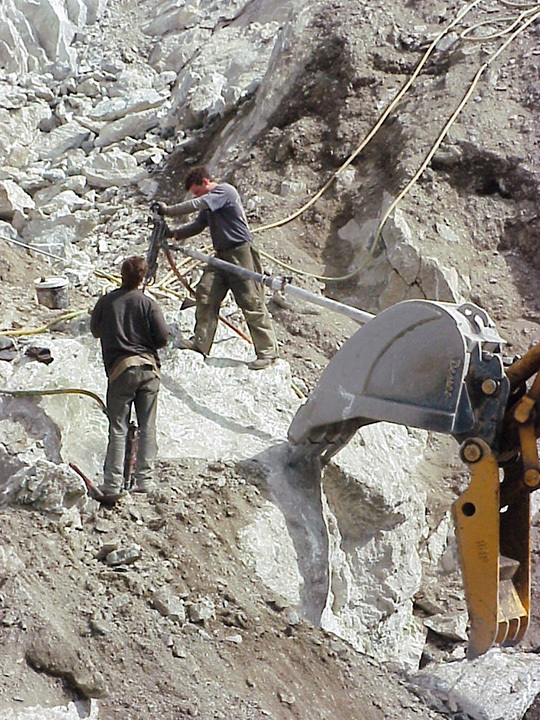 The wider deposits are very challenging to quarry. 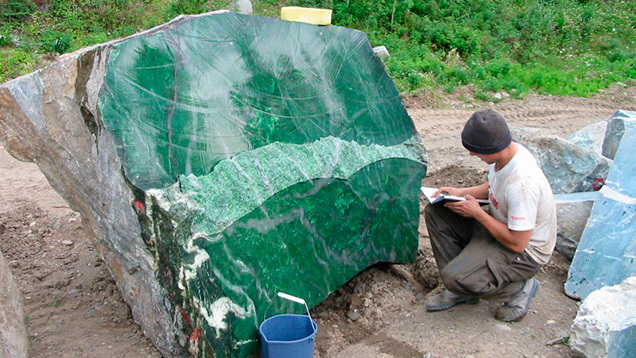 Nephrite boulders on the surface sometimes reach weights of 200 tons and are rarely under 100 pounds, but Jade West tries to limit the weight of its boulders to five tons, which is a reasonable size for them to mine, handle, and transport on trucks to the nearest town, about 100 miles away. The average weight is two tons, a size that satisfies most of the carving factories in China. 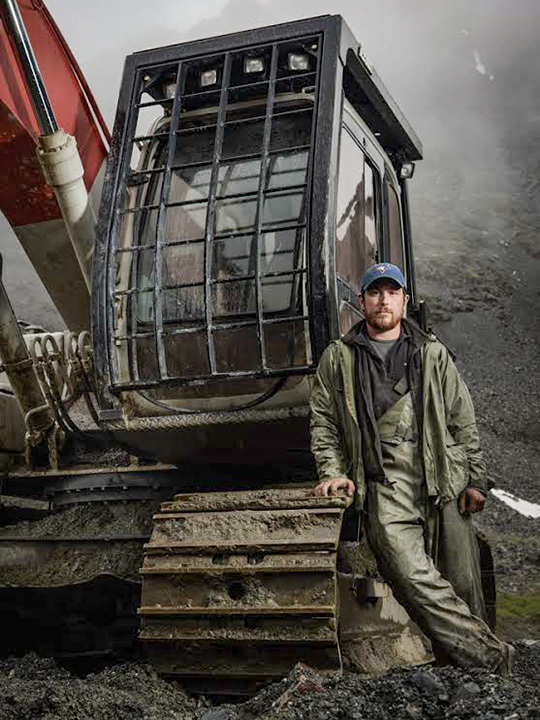 Sophisticated exploration techniques and an understanding of the area’s geology are the keys to successful mining operations and lengthening of a mine’s productive life. 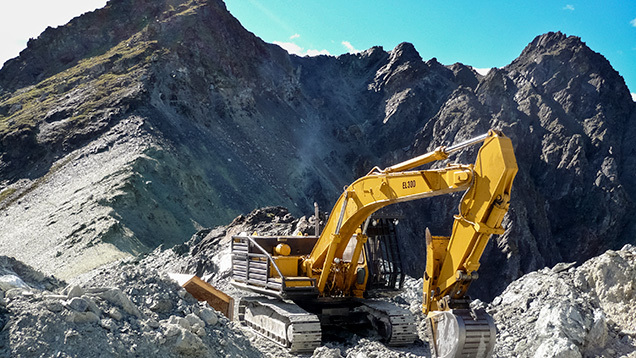 Jade West Group invests a lot of capital in its exploration projects. The company adopted core drilling in 1975, and it’s still their most powerful and reliable exploration tool. 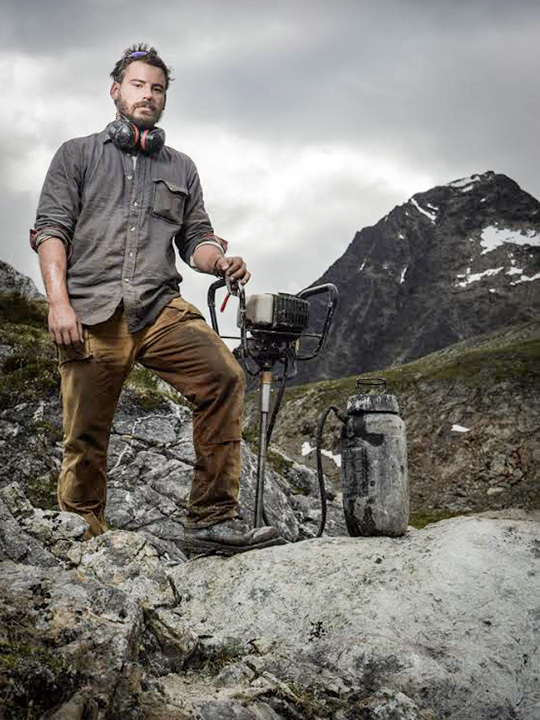 They drill into the mountain with water-cooled diamond-tipped drills, then extract the cores and examine them to determine if the nephrite is of suitable quality to turn into a marketable finished product. Since the mining season is short, the miners must call on a great deal of experience when determining the areas from which they will take core samples. Although it entered the China market only about 10 to 15 years ago, green nephrite from Russia has gained a great reputation because of its bright color and good transparency. Both white and green nephrite are mined in Russia. Some of the white stones can be of equal quality to the most sought-after “mutton fat” jade and can be sold for high prices in China. Green nephrite is more readily available than the white varieties. 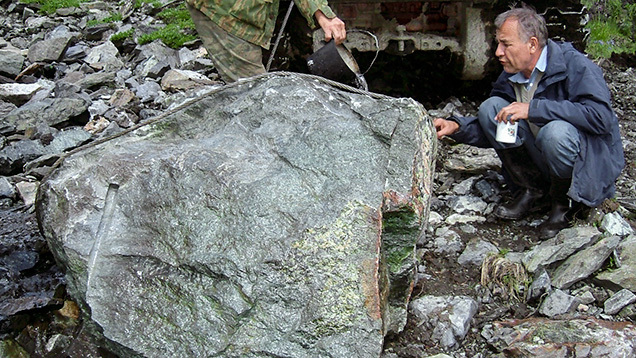 The first green nephrite boulders were discovered on riverbanks in Russia’s Sayan area in 1826. There were additional discoveries in 1851 along the Onot River. 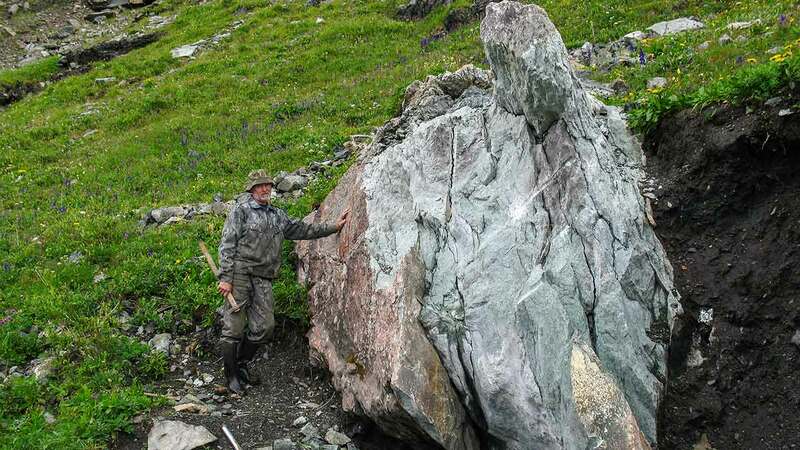 The first primary nephrite deposit was reportedly discovered in 1986 (Burtseva et al., 2015). 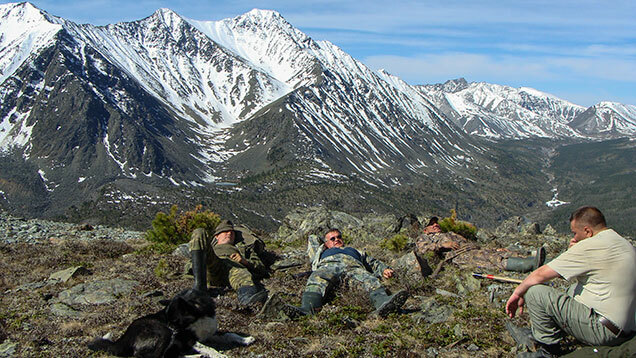 All of Russia’s nephrite mining areas have spectacular views of snow-capped mountains, valleys, and rivers. Courtesy Sibirgeology, Russia. Siberian nephrite mines are located in extremely remote areas of Russia, in the Eastern Sayan Mountains and the Dzhida areas to the southwest of Lake Baikal, along with the Parama massif to the northeast of the lake. The Sayan Mountains are geographically and geologically related to the Altai Mountains that cross northwestern China, northern Mongolia, and Southwestern Russia. Many people believe that this connection is the reason for the similar qualities of nephrite from China and Russia. kilometers. Map adapted from Burtseva et al., 2015.
mined in Siberia a long time ago. Material of this quality is very hard to find today. The green nephrite mines that the Chinese are familiar with are almost all clustered in the Eastern Sayan Mountains. From 2005 until now, Chinese nephrite dealers have been sourcing much of their inventory from these mines. Located along the southern margin of the Siberian craton, this area covers over 250 square kilometers. The Russians have recognized and carefully studied more than 50 ultramafic rock units (Burtseva et al., 2015), almost all within the Ospa-Kitoi and Khara-Nur massifs. The three largest green nephrite mines include Ospa (known to the Chinese as #7 and #11 mines), Gorlygol (known to the Chinese as #10 mine) and Ulankhoda. There are 15 recognized nephrite veins in the Ospa deposit, more than 30 in Gorlygol, and more than 20 in Ulankhoda (Burtseva et al., 2015). Green nephrite formation occurs along the contact between serpentinites and metasomatized mafic and felsic dikes (Burtseva et al., 2015). 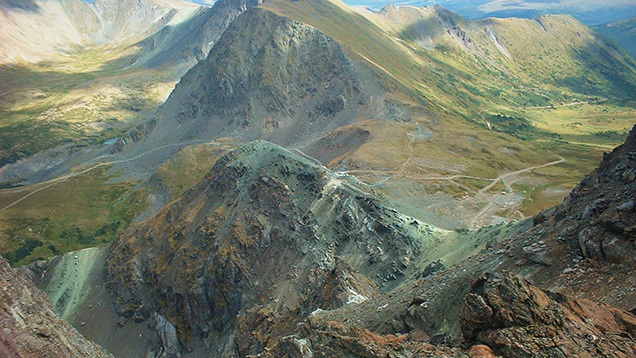 The terrain in the Siberian nephrite mining areas is extremely rugged. The best way to access these areas is by helicopter. 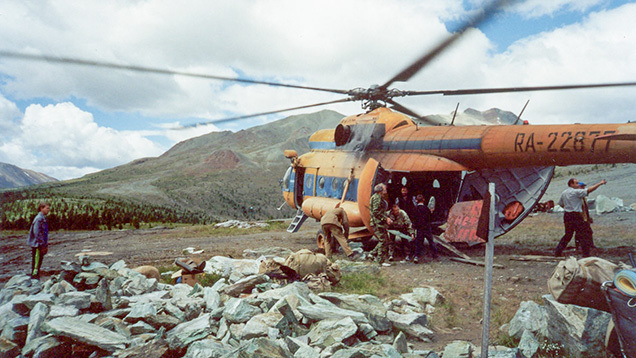 Retired army helicopters are often hired to transport people and supplies to the mining sites. Courtesy Sibirgeology, Russia. 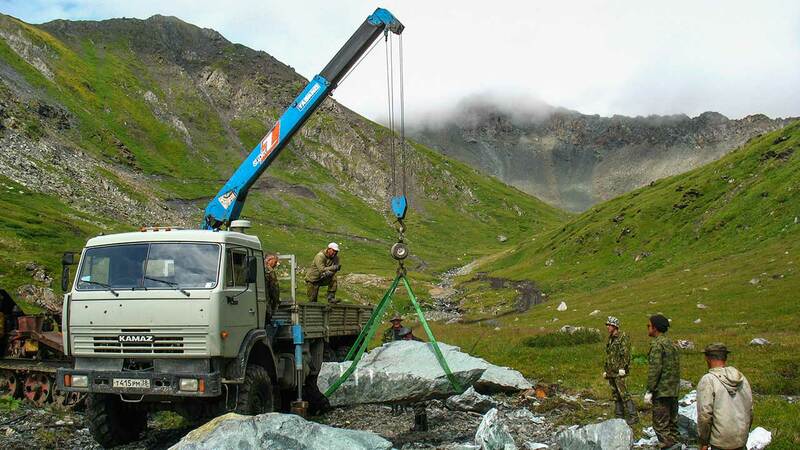 The mining of Siberian green nephrite is extremely challenging due to a combination of harsh weather conditions and extremely rugged local terrain. 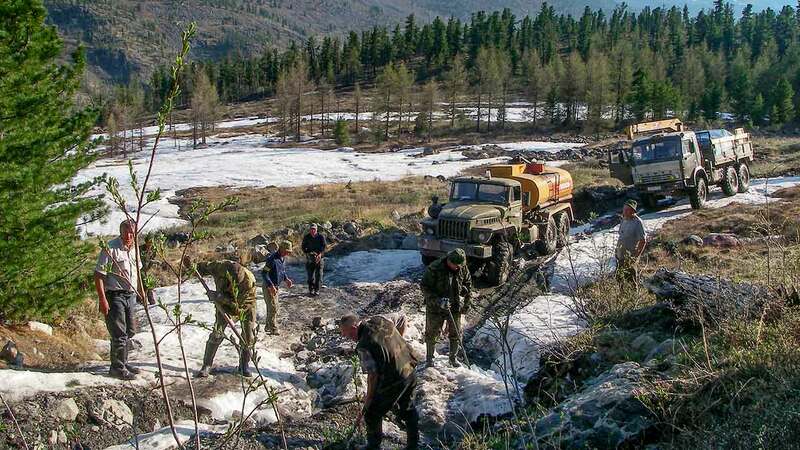 The mining sites can best be accessed by helicopter in the summer or by heavy duty trucks along frozen rivers in winter. Explorers need to fly to Irkutsk, the nearest transitional city, and start from there. It takes at least four to five days to reach the mining sites. Retired six-wheel army trucks are the most available and reliable transport vehicles. Russian geologist Dr. Sasha Sekerin was one of the earliest explorers of nephrite deposits in the Western and Eastern Sayan Mountains. Today, he remains a highly respected jade expert in Russia. Dr. Sekerin served as a research scientist in the Zemnoy Kory (Earth Crust) Institute in Irkutsk for over a decade until the Soviet Union fell apart. He then became a nephrite jade miner. 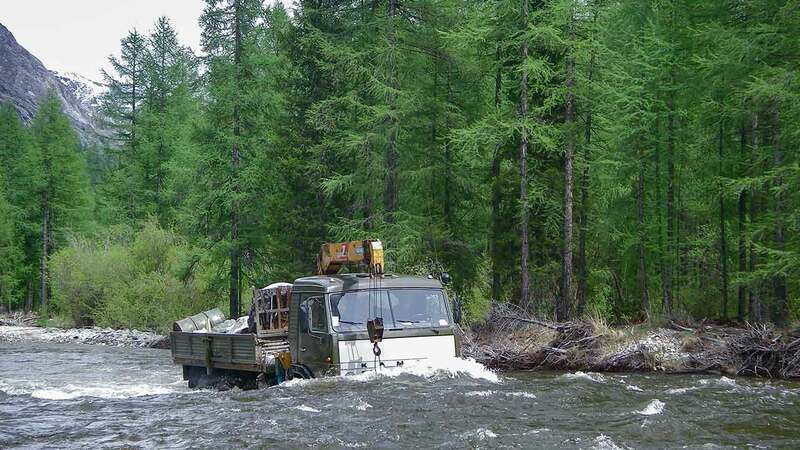 Sasha and his colleagues began exploring the area in 1975 and have guided foreign explorers and nephrite investors to the area over the past decade. Dr. Sasha Sekerin is highly respected as a nephrite jade expert in Russia. 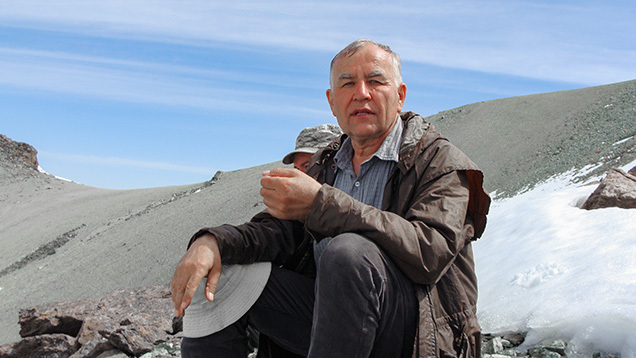 He began exploring the nephrite deposits in Siberia in the 1970s. After the Soviet Union collapsed he became a nephrite jade miner. Courtesy Sibirgeology, Russia. 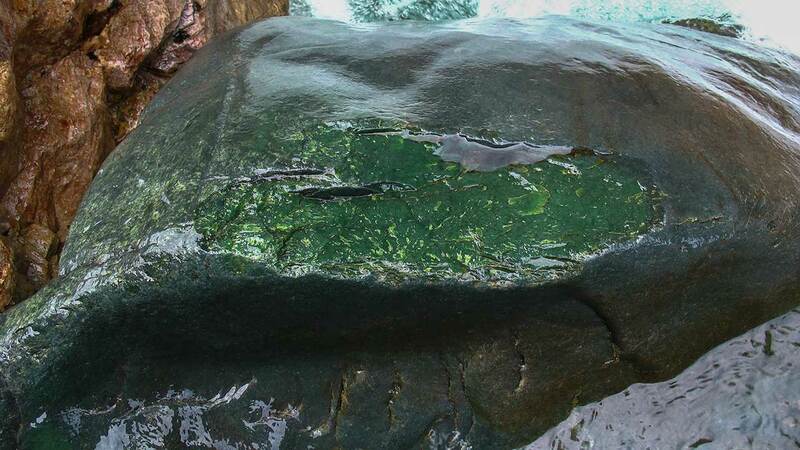 To mine the nephrite, miners inject expansion agents into fractures in the giant rocks. They limit the use of explosives to protect the nephrite from damage. After injecting the agents, they wait a year, during which natural temperature changes help to fracture the rocks and get them ready for the mining season. The miners label the rocks to avoid conflicting claims, but due to increasing demand and skyrocketing prices, some locals will risk extracting the labeled claims during the winter. Large extracted nephrite is sawn on-site so it’s a reasonable size for transport. North American nephrite tools found in British Columbia’s Cariboo region date back more than 4,000 years, but the region’s green nephrite did not find its way into the market until independent Chinese miners recognized it during the 1850s gold rush in California and British Columbia’s Fraser River area. They shipped nephrite boulders from both areas back to China for processing. Some of the top-quality material was taken by the imperial court and became part of its collection. Since then, British Columbia’s green nephrite has been imported continuously into China. 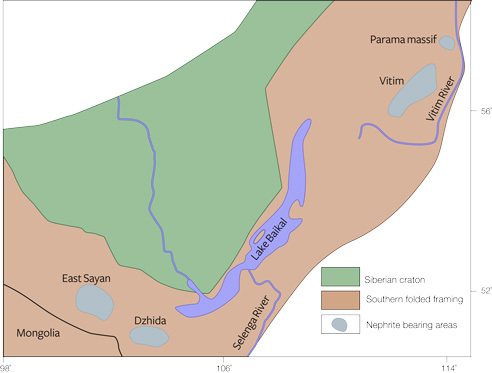 This map depicts the mine-to-market route of green nephrite. Canada and Russia are the two main suppliers to the Chinese market while China’s Xinjiang is a minor supplier. Almost all goods are processed in southern China, with Guangzhou as the hub. Finished products are sold mostly in China’s domestic market while a minor portion is exported to other countries. 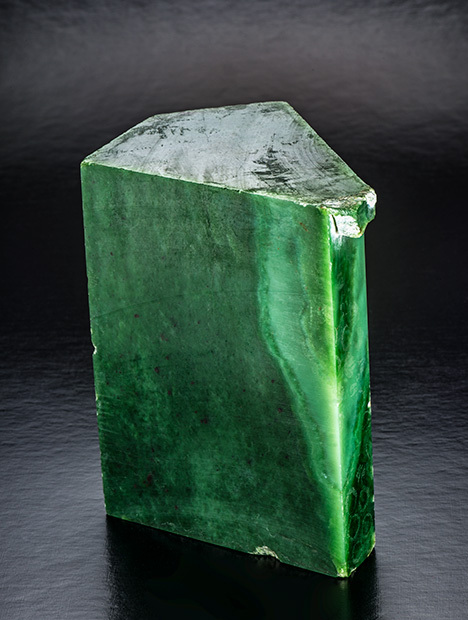 From 1885 to 1949, green nephrite from British Columbia was entering the China market through different channels, but the amounts were quite limited. The scarcity made this material quite expensive to obtain. In the early 1930s, one of four then-famous jade carvers created a premium carving using a huge piece of green nephrite rough from British Columbia. This rough was reportedly bought at an auction with a final price of 6000 silver dollars, China’s currency of the time. History’s best estimate of the average annual income at the time was about 250 silver dollars for people working in big cities such as Shanghai and Beijing. This meant that a normal city worker had to work for 24 years to make enough money to purchase nephrite rough. 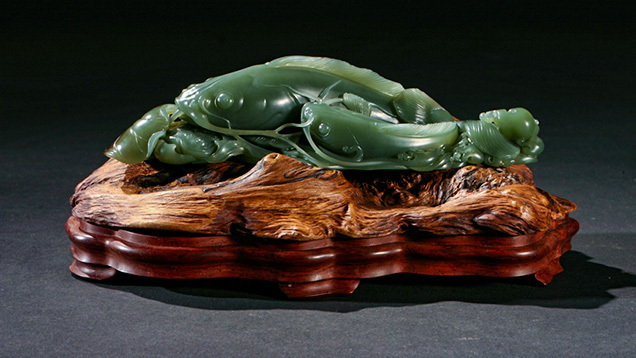 Green nephrite from British Columbia is a very popular gem material for carving in China. 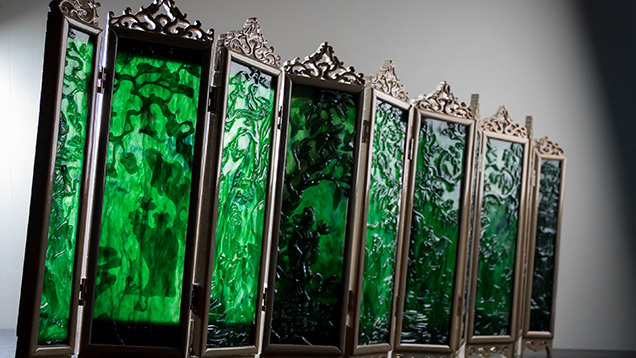 This miniature folded screen features green nephrite panels mounted in wood frames. It mimics the full-size screen that is a typical traditional Chinese furniture piece used to maintain privacy in a certain area in a room. Courtesy Jade West Group. In the 1980s, Kirk Makepeace of Jade West Group was buying out failed jade mining companies. At that time, almost all the country’s nephrite was being exported to Taiwan. The Taiwanese market could not consume all the production and carved a lot of the material into trinkets and extremely inexpensive jewelry for the domestic market and for export. 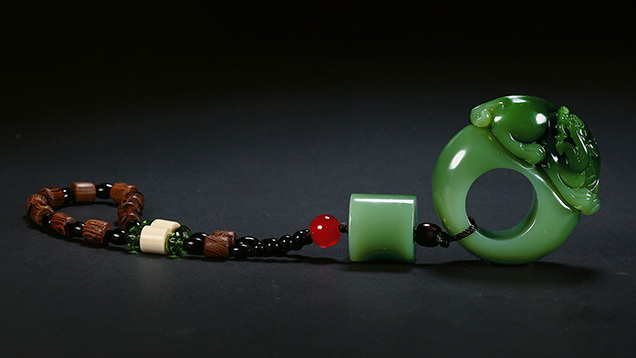 Mainland China’s market was not yet open and the inexpensive jewelry market provided enough demand to aid the development of the Canadian nephrite mining industry and allow it to dominate for almost 30 years. Mr. Makepeace recalls six- to eight-millimeter good-quality nephrite bead strands selling in the tourist stores of San Francisco’s Chinatown for five dollars each in the early 1980s. Almost all of British Columbia’s production was exported to China, including Taiwan. Almost all carving and manufacturing take place in mainland China. Courtesy Jade West Group. Jade West Group began exporting nephrite into China in 1986 and found market resistance to accepting nephrite from Canada as jade. However, Mr. Makepeace had a strong feeling about the future of China’s nephrite market. He was quoted in a September 1987 National Geographic article on jade as saying, “My secret weapon is China. I’ve broken into that market. Last year I sold about 104 tons: 100 to China and only 4 to Taiwan.” After 2000, the demand from China increased dramatically as China’s growing middle class had more disposable income to spend. Nephrite jade was a very affordable alternative to jadeite jade while still allowing much higher prices as compared to the decades when it was sold just as a trinket. Since the Chinese are the main consumers of green nephrite, almost all of the carving designs are customized for this target group. Once in a while, a non-traditional feature will appear, such as the faceted beads in these bracelets. Courtesy Jade West Group. When Mr. Makepeace went to Hetian, he found that most of the green “Hetian nephrite” was actually from British Columbia. Local merchants sold them as Hetian jade to take advantage of the overwhelming historical reputation of that material and the higher price that was possible because of it (Glaude Adams, 2009). Today, both British Columbian and Siberian green nephrite are more respected in China. More and more dealers are willing to disclose the real origin of their inventory to consumers, but selling everything as Hetian jade is still quite common in local markets. 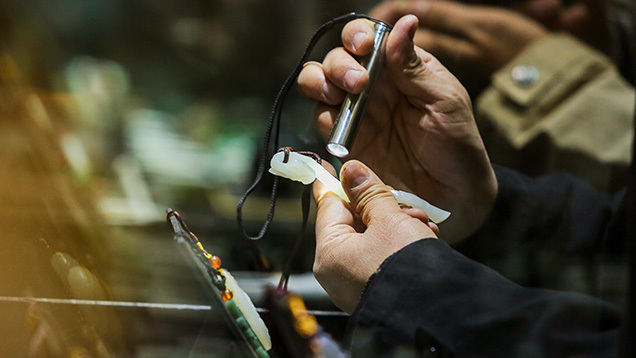 In a local Hetian jade trading center, among the 500 to 600 shops, only five were carrying inventory made of Xinjiang Manasi green nephrite in 2012. Recent reports suggest that this situation is still about the same. 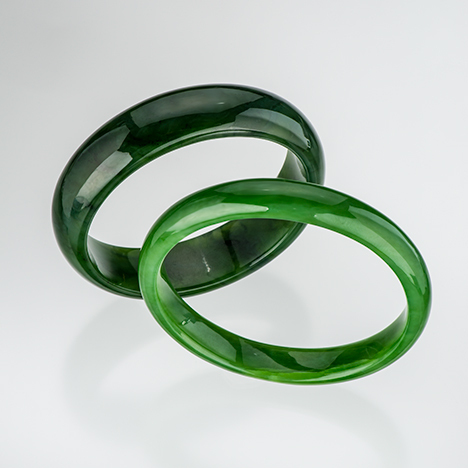 The green nephrite bangles in the China market are mainly from British Columbia and Siberia. It is very rare to see good-quality goods made of Xingjiang material. Courtesy Jade West Group. Siberian green nephrite first entered the China market in the early 1990s through the border trading town of Dongning in Heilongjiang Province, China. There are more than a hundred nephrite jade dealers doing business in Dongning. Between 2005 and 2011, due to the shortage of rough, the price of white nephrite skyrocketed from $500 to $10,000 a kilo, making it unaffordable for the majority of consumers. This opened the opportunity for large amounts of well-priced green nephrite to be imported into China. Between 2005 and 2008, Siberian green nephrite gained a lot of respect from Chinese consumers. Bangles and beads from the Ospa #7 deposit became a consumer favorite, while material from Gorlygol #10 was used mainly for carvings. As you’ve read, the nephrite market’s most important event was the Beijing 2008 Olympics, where the medals incorporated nephrite jade from China. The Chinese government created an educational and promotional campaign to explain its significance. This completely changed the market for nephrite in China, as demand and prices increased. Jade West’s price for top-quality rough nephrite from Canada was twenty dollars a kilo just before the Olympics. Today the top qualities sell for prices between $200 and $2,000 a kilo. 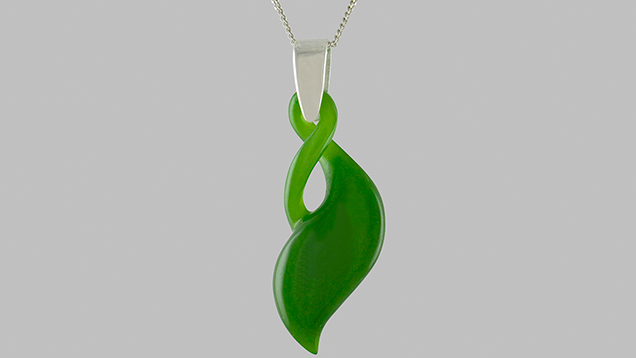 This Maori-style pendant is made of green nephrite from a Siberian deposit (#10). Although most of the production from this deposit is only good for carving, top-quality material can be used in jewelry. Courtesy Jade Factory and Jade Mountain. The Beijing Olympic Games also boosted the price of green nephrite imported from Russia, especially the nice-quality rough from the Ospa #7 deposit. After 2008, a mine-to-market green nephrite relationship formed between Russia and China. Siberian nephrite trading and carving centers were formed in Beijing, Ha’erbin, Henan and border towns such as Dongning and Manchuria. Realizing nephrite’s great economic potential, Russian miners and dealers keep raising the price of nephrite rough. At the same time, the Russian government limits the amount of nephrite being exported to China. Both factors put pressure on Chinese business owners and caused prices to jump even higher. At the beginning of 2013, Siberian green nephrite rough was imported at an average price of about US$500 to $650 a kilo. At the end of 2014, the average price in the Dongning market was about US$1000 a kilo. High-quality cat’s-eye Siberian green nephrite rough reached a price of US$50,000 a kilo in 2015, while the non-cat’s-eye top-quality material was priced at US$2000 a kilo. color and the quality of the chatoyancy make this material a favorite of Chinese consumers. Courtesy Jade Factory and Jade Mountain. Siberian green nephrite now dominates the middle to high-end green nephrite market in China, while British Columbia material dominates the lower-end market. Though Xinjiang is historically the most important nephrite source, this is not true of green nephrite. The market share of Xinjiang green nephrite is very limited and can’t compete with Siberian and British Columbia products. Though Manasi green nephrite is a local product and bears the longest history in China, limited production gives it an awkward position in the current nephrite market. Annual production is about 40 tons, with a very low percentage of high-quality rough. This explains why it’s difficult to find Manasi jade jewelry, even in the local market in Xinjiang. Since 1973, annual production has ranged from one ton to about 35 tons. Between 1973 and 1978, production was pretty high, with an average of 15 tons per year. Between 1981 and 1988, annual production decreased to about 5 tons. 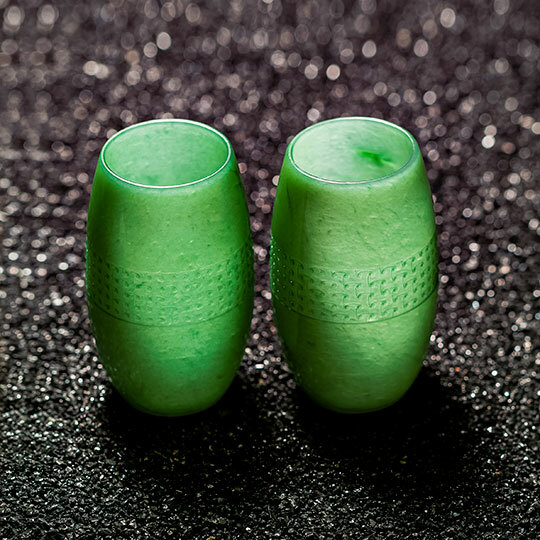 Though Manasi jade and Hetian jade boast the highest reputation in China, they make up a minority of the market due to very limited production. This Hetian green nephrite carving was fashioned by Master Carver Yan Guiming, and represents the best-quality material from Xingjiang, China. It is in the collection of the China National Arts & Crafts Museum. The rough came from a secondary deposit. Courtesy China Gems Magazine. .While demand from China has changed over the years, production from Canada has not changed dramatically. Canada exports about 400 tons of nephrite a year, a relatively small amount when compared to Myanmar’s jadeite exports, at 20,000 tons a year. Any price increase is primarily due to the domestic demand in China, rather than the nephrite pieces exported from Taiwan as inexpensive tourist souvenirs. Over the last 10 years, about 90 percent of Jade West’s production has gone to Mainland China, with approximately five percent to Taiwan and five percent to Vietnam and Thailand. Comparatively small amounts go to Germany and North America. The nephrite that goes to China is primarily for the Chinese domestic market. 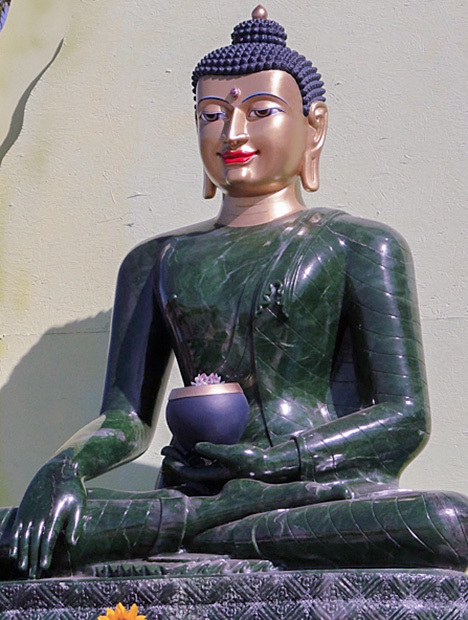 Thailand, Vietnam, Nepal and some other Southeast Asian countries buy nephrite for religious carvings of Buddha. Native Americans in the Pacific Northwest used nephrite as a tool but, unlike in China, never incorporated it in any culturally significant way. 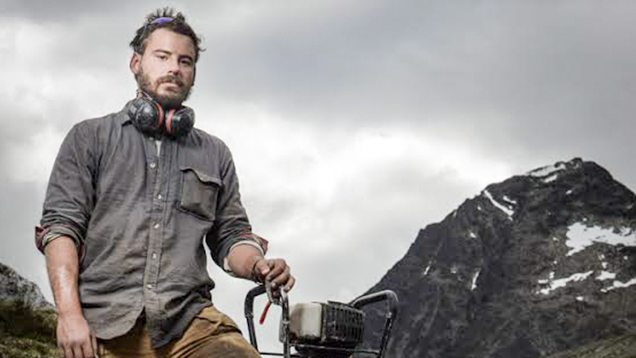 Canada’s domestic market consumes about five tons of rough a year, supplying a few local high-end carving artists. countries to inspire people to seek peace in their lives. Courtesy of Jade West Group. Before 1999, with limited average annual production of 20 tons, Siberian nephrite only supplied the Russian and European market. Between 2000 and 2002, annual production increased from about 40 tons to 100 tons. Before 2005, mining nephrite was not actually profitable for Siberian miners. This was due to the high mining, transportation, and processing costs, which contrasted sharply with the low price of the rough. The average price for Siberian green nephrite rough was only $1.5 to $5 a kilo, which in most cases didn’t even cover mining costs. In addition, only about 30 percent of the mined material had commercial value. 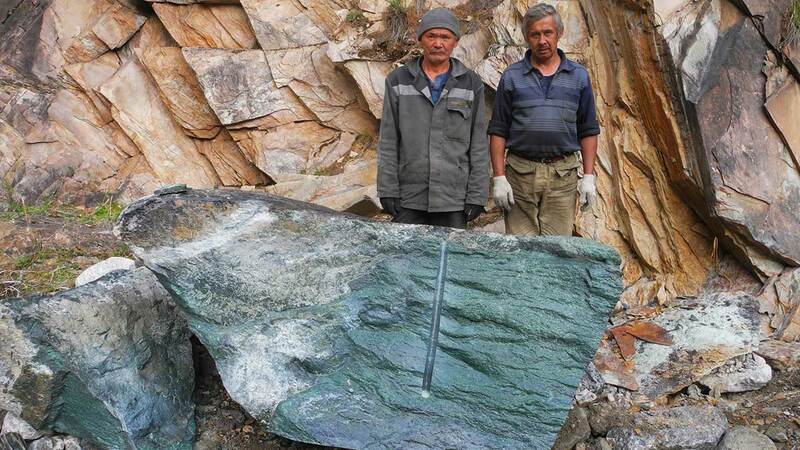 Large-scale mining of nephrite did not happen in Siberia until after 2005. 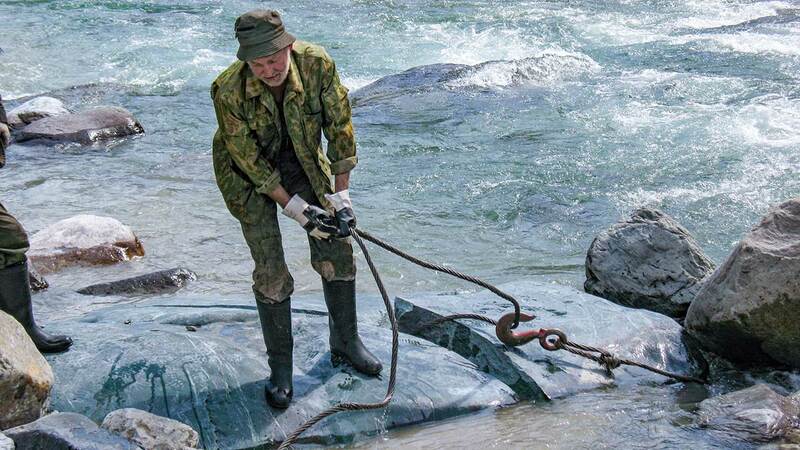 In 2009, miners found a nearly five-ton green nephrite boulder along the Arahushun River in Siberia. Expansion agent was placed in the boulder, and after a year, miners split the cracked boulder into smaller pieces and transported them to the town. Photo courtesy of Jade Factory and Jade Mountain. After 2005, consumer focus switched to green nephrite due to the skyrocketing price of white nephrite. 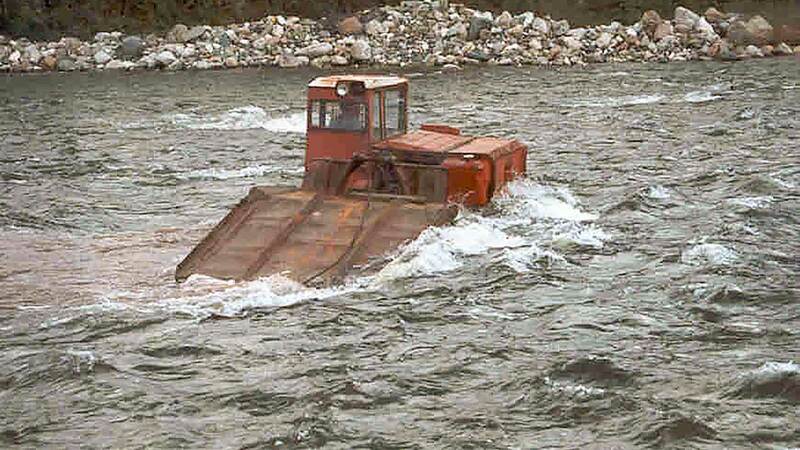 This suddenly made mining in Siberia very profitable, leading to an increase in production. From 2008 to 2010, annual production in Siberia increased from around 100 tons to about 500 tons. When #7 and #10 deposits were getting close to exhaustion around 2009 and 2010, main production came from newly exploited #37, #32 and #36 deposits. Green nephrite from these newer deposits is an increasing presence in the China market. Nephrite jade expert Dr. Sasha Sekerin checks the quality of a giant piece of rough. Pouring water on the surface reveals the color better. Courtesy of Jade Factory and Jade Mountain. Overall, the green nephrite market in China is dominated by goods from Canada and Russia, with sporadic supplies from Xinjiang. Each source’s market share is dictated mostly by its production levels. Although every source produces a whole range of materials with different qualities, there are some characteristics that are preferred by consumers. Color is green nephrite’s most important value factor. Chinese literature encompasses many different shades of green, and the preferred nephrite color is highly influenced by that for jadeite jade. Color, texture, and clarity are all important value factors that affect the price. In addition, different demographic groups have different tastes and preferences. In this thin section of green nephrite from the #10 deposit in Siberia, the black dots are chromite and the whitish strips are parallel tremolite crystals. Courtesy Jade Factory and Jade Mountain. Green nephrite from all three main sources shares some features. The main mineral is tremolite. “Black dots” are common inclusions, determined by gemological research to be chromite. The Chinese trade term “waterline” refers to the whitish stripes that are, in fact, parallel tremolite crystals. Researchers think that the bright green is mainly caused by chromium ions, while iron ions also make a contribution. Weldon, courtesy Jade West Group. Manasi green nephrite normally has more “black dots” and slightly darker green color. Although top-quality Manasi jade can be compared to the top-quality material from Hetian and Siberia, it is very hard to find. 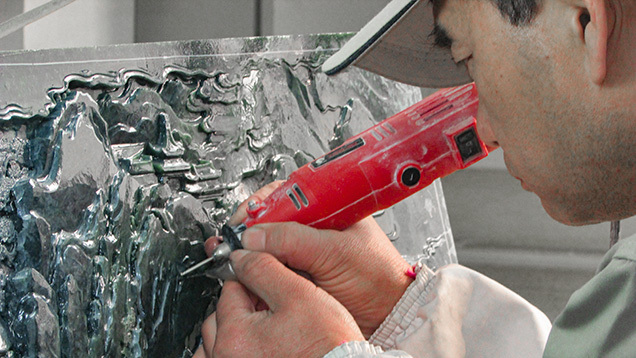 The majority of the production is used for large-scale nephrite carvings rather than jewelry. Many Xinjiang dealers feel that it is hard to sell jewelry made of Manasi green nephrite because the price is fairly high, so they have less desire to spend money on Manasi inventory. 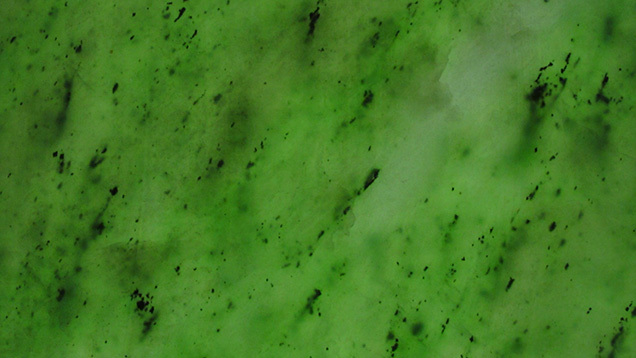 Green nephrite from British Columbia usually has more “black dots” and “waterline” than Siberian material, although its top-quality goods can compete with the Siberian top quality. Most British Columbian production is priced to satisfy the middle to lower-end market. Some of the material contains some greenish dots that turned out to be chrome grossular garnet (Sun and Wang, 2014). The slightly darker green color of British Columbia nephrite actually falls into the color variety called “spinach green” in the trade. It is a slightly grayish or bluish green that is favored by older consumers and people who prefer a more conservative look. Spinach green has always been the most-desired green nephrite color. Though it’s not as bright, it matches very well with nephrite’s conservative image in the Chinese market. distribution are clearly visible. Courtesy of Jade West Group. British Columbia’s most famous green nephrite is Polar Jade from the Polar Mine. The mine’s green nephrite has a brighter green color than other British Columbia materials. Its Chinese name loosely means “jade from the Arctic circle,” which has become a successful name for promotional purposes. The Jade West Group, which owns and operates the mine, says that its production has become very limited. The beads in the strand are from the Polar Mine in British Columbia. 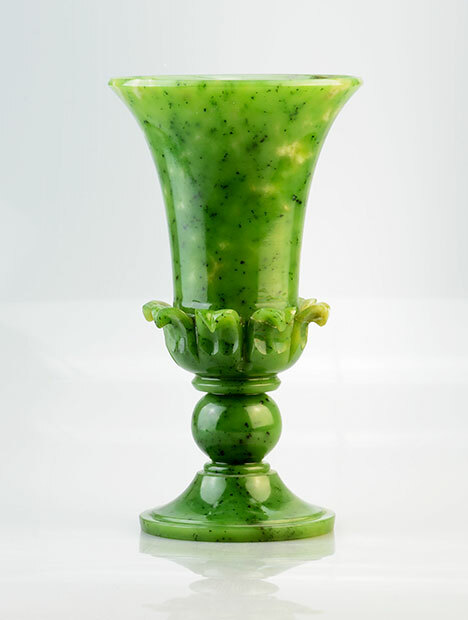 Polar Jade is considered the best of British Columbia’s green nephrite production. There is no active mining going on there at the moment, making the available goods even more valuable. The rough is from Wyoming, US, where mining has also ceased. This rough represents its best-quality material. Courtesy Jade West Group. Of the three main sources, top-quality Siberian green nephrite can have very fine texture and the vivid green color that’s especially favored by young consumers. Because it tends to have fewer “black dots” and well-distributed color, modern green nephrite items usually seen in auctions are mostly made of Siberian materials (per Ao Yan comment). The general impression among consumers is that Siberian green nephrite is generally higher in quality than material from Xinjiang or British Columbia. Its market price is correspondingly higher. According to Nikki Makepeace, the sales manager of Jade West Group, the manufacturing cost for Siberian material is a lot higher than that for Canadian or Chinese materials. When they send the Siberian material to China for fashioning, it often costs five to six times more than the British Columbia nephrite. 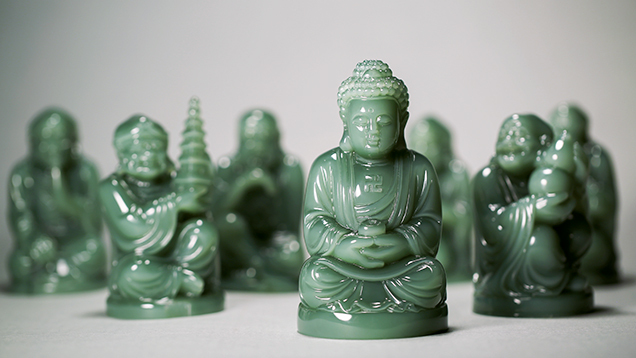 This suite of 18 arhats—followers of Buddha—was carved from Siberian green nephrite. The color distribution in top-quality Siberian green nephrite can be extremely even, as seen in the absence of black dots in these figures. Courtesy Beijing Boguan Auction House. The best Siberian material comes from the Ospa #7 deposit. Its green color is well distributed and it has fewer black dots and super-fine texture. Unfortunately, resources from the original deposit were mostly exhausted in 2010. Though geologists predict that there is still about 1,000 tons of material remaining, the depth of the ore bodies makes it too expensive to extract. In 2009, miners started extracting green nephrite from a neighboring deposit. Its production is similar in quality to the #7 material. 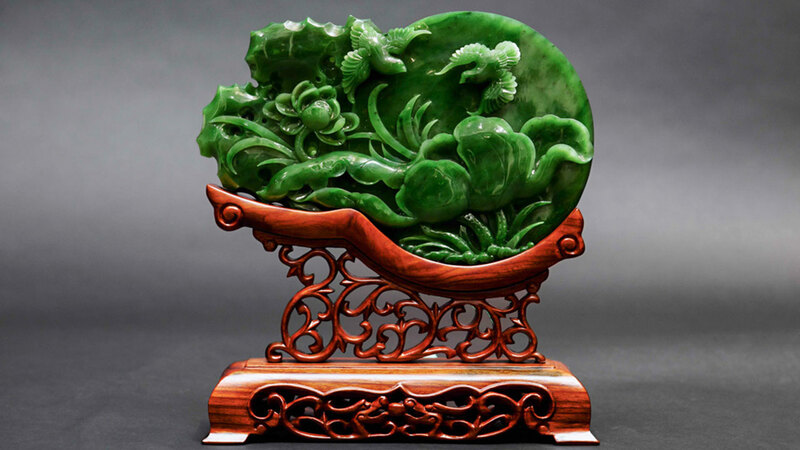 The carving of nephrite has a history that goes back thousands of years. The craft reached its peak during the Qing dynasty. Emperor Qianlong, the biggest fan of both jadeite and nephrite jade, transported the best rough from Xinjiang province to Yangzhou, a town in Southern China, for carving. Yangzhou craftspeople have always been considered the best nephrite jade artisans, owing to generations of history-making jade carvers. 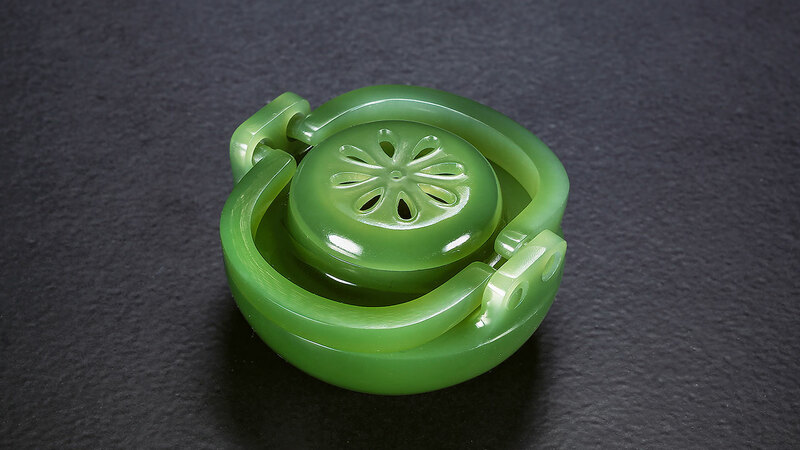 Today, the best-quality green nephrite is still carved in Yangzhou, even though the manufacturing and carving capacity in Guangzhou is a lot higher and their craftspeople are very good. 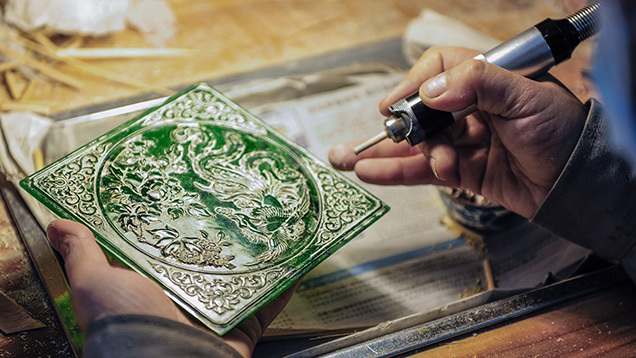 A carver in Guangzhou is carving a piece of green nephrite from British Columbia. The plaque displays traditional Chinese themes and patterns. Courtesy Jade West Group. Before nephrite from Siberia and British Columbia became more respected in China, many master carvers refused to carve these foreign materials. Today, due partially to increased knowledge and understanding of the sources, the situation has changed. The quality of green nephrite from Siberia and British Columbia is now highly respected and appreciated by carvers all over China. 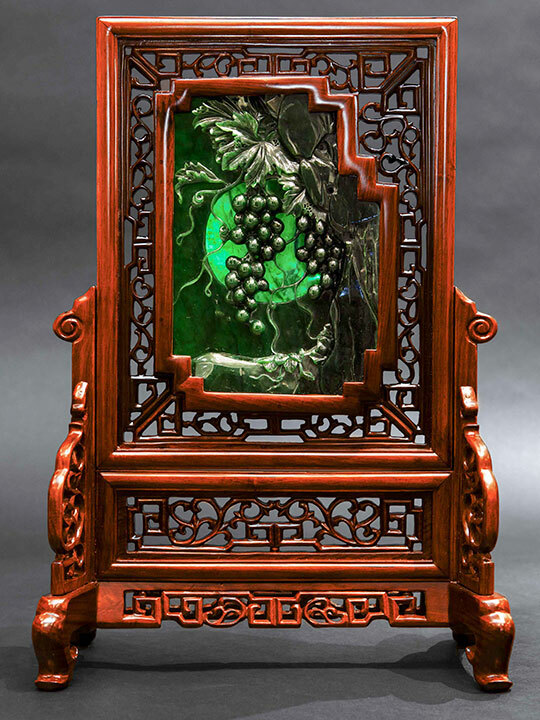 When describing the carving of nephrite, Kirk Makepeace explained the differences between carvings sold in China and those exported for the Western market. The Chinese carvings are closely related to the country’s culture, executed with a high degree of passion and skill. They typically depict traditional Chinese themes and often are highly detailed. Their themes are not appreciated as much in the West, so carvings for that market display a much simpler, less labor intensive carving style and themes that are more marketable in the West. The Western designs are often based on native Inuit soapstone carvings. 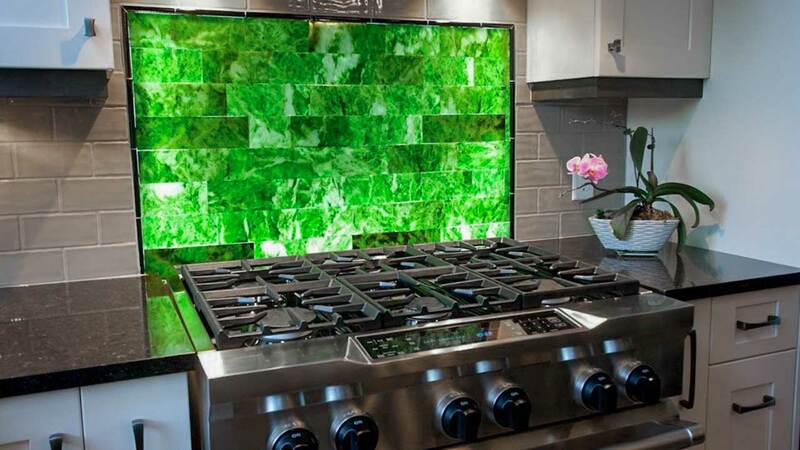 Western people also like to use nephrite that is not gem-quality in their home decor. Mr. Makepeace said that appreciation for nephrite is increasing in the North American market. People have come to a much greater understanding of what nephrite is and place a higher value on it today. Since China is the main market for nephrite jade, the local industry has tried for decades to establish a grading standard. However, due to the complexity of the material, this is still a work in progress. 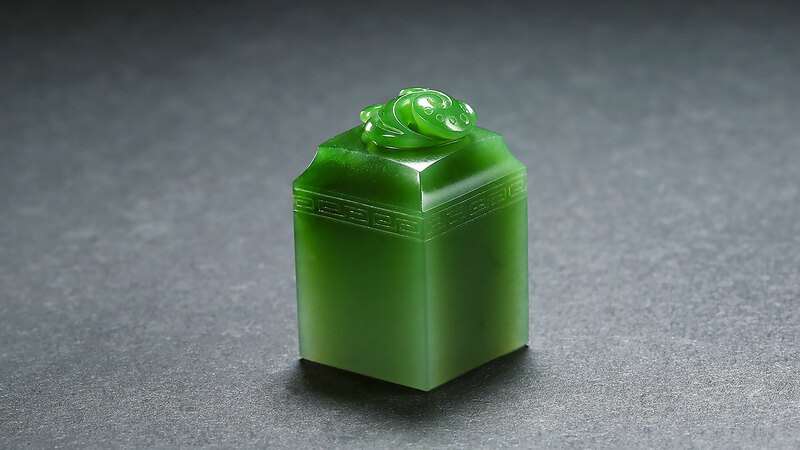 One recent change in the national standard of gemstone names is to broaden the definition of “Hetian Jade.” Chinese dealers take advantage of the fact that the name is fairly well-known by selling almost all their nephrite inventory as “Hetian jade” in order to increase their profits. Meanwhile, actual top-quality Hetian nephrite is extremely rare. Green nephrite from Siberia and British Columbia can be of higher quality but because it is not from Xinjiang, the price differences might not be equivalent. The new national standard allows all green nephrite to be named “Hetian Jade” on reports. The effect of this change is still unknown. It will take a while for the trade and consumers to provide informative feedback. 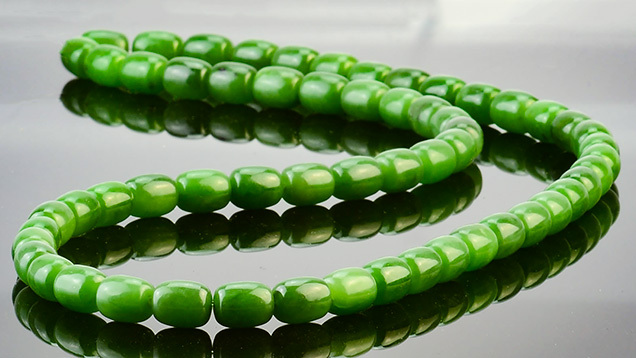 This strand is composed of high-quality, Siberian nephrite beads. Courtesy Jade West Group. The constantly increasing price for nephrite in general has forced source areas to develop local grading standards. The most recent is the Manasi green nephrite grading standard issued by the Xinjiang Uyghur Autonomous Region Quality Supervision Bureau. 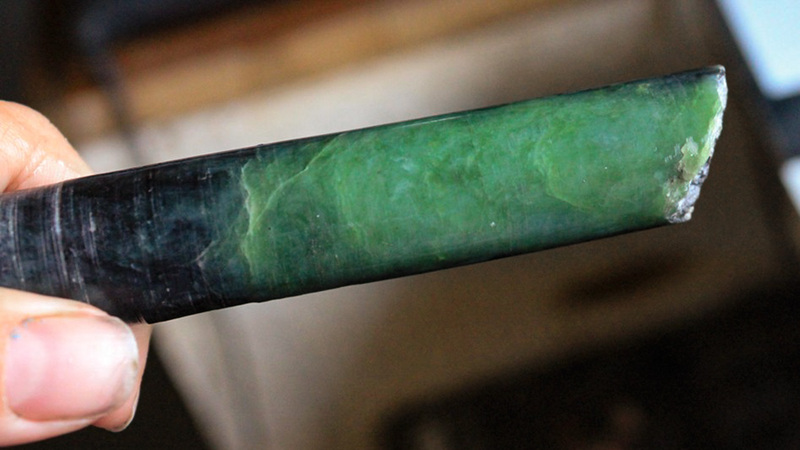 The standard applies to the green nephrite mined in Xinjiang. Its purpose is to further regulate the local rough nephrite market. This standard uses color, texture, and clarity as the main value factors for evaluating Manasi green nephrite into four different grades: Excellent, Good, Fine, and Poor. Jade West grades nephrite for their customers using AAA, AA, A, B, and C categories. Triple A is applied to the most expensive bracelets and pendants and accounts for 3 percent of the company’s production. Most of the jewelry from Jade West’s production is AA to A, with carvings often fashioned from the B and C grades. The carving-quality material represents about 70 percent of production and sells for $20 to $30 dollars a kilo in rough form. Lower grades are used for translucent tiles, burial caskets, and a wide variety of industrial or ornamental uses. The industrial grades have more muted color and higher concentrations of black inclusions, which are often magnetite and fractures. A similar rough-grading system also works for Siberian green nephrite rough. 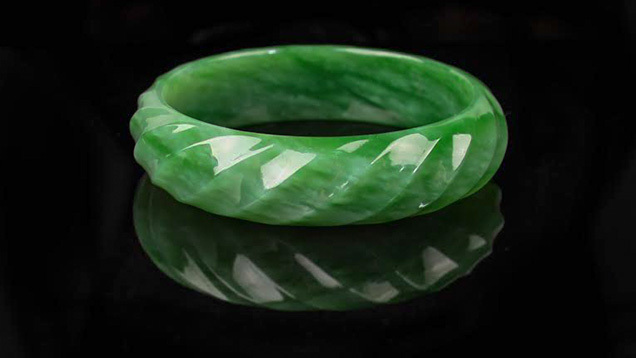 This carved bangle is made of AA-grade Siberian green nephrite. Courtesy Jade West Group. Owing to the fast-growing gem and jewelry market in mainland China, there are multiple sales channels for green nephrite. These include wholesale trading centers, retail stores, online sites, and auction houses. A buyer checks the quality of a piece of white nephrite jade at the preview of an auction. Courtesy Beijing Boguan Auction House. Large jade trading centers usually carry both nephrite and jadeite jade of different shapes and sizes. Trading centers in China that specialize in nephrite jade are mainly clustered in the areas close to the source in Xinjiang. In Urumqi, there are over 1,300 individual nephrite businesses in five major trading centers, local street markets, and more. Xinjiang dealers trade in goods from all different sources. Trading centers and retail stores in the border towns near Russia deal mainly in imported Siberian nephrite. Large jade markets in Guangdong carry both jadeite and nephrite jade and they source material from all over the world. 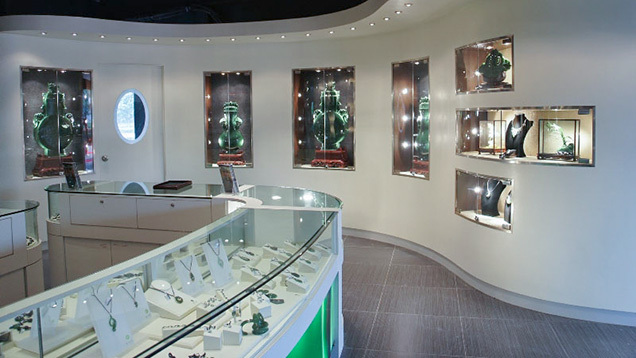 Retail stores specializing in nephrite are more and more common in major cities. 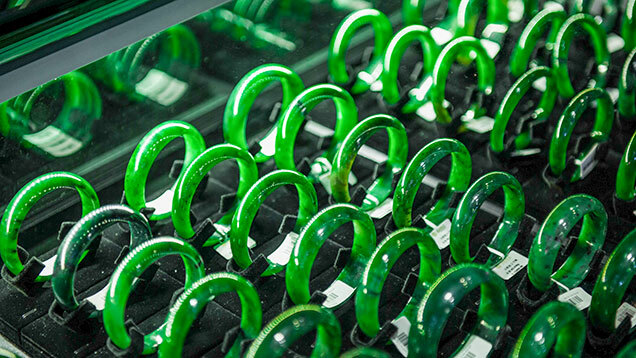 Although their sales still can’t compare to trading centers, many business owners already realize the importance of branding even for nephrite jade. Unlike the sales-oriented trading centers, retail stores have much more flexibility to develop special displays and consumer services. 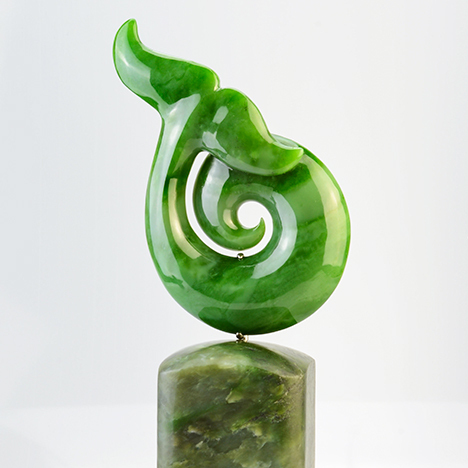 Nephrite branding is primarily dedicated to passing on the nephrite culture. 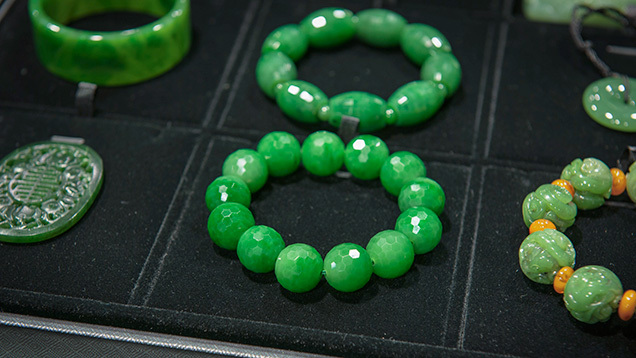 Branded nephrite jade is still not quite as common as jadeite jade or other gemstone jewelry. Jade Factory is a nephrite jade jewelry brand that operates stores both overseas and in mainland China. Courtesy Jade Factory and Jade Mountain. Along with the rapid development of e-commerce in every field, online jade trading platforms and websites for individual businesses are also quite common. Because there is still no universal grading standard for jade, there are many problems associated with online jade purchases. Buyers have to be extra cautious when buying jade online unless they know they are dealing with a trustworthy source. 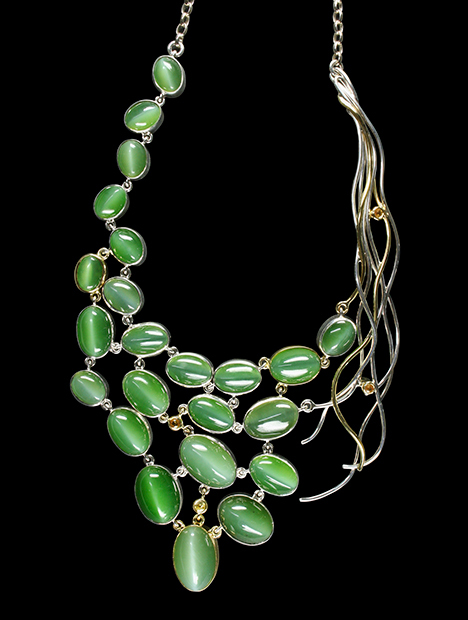 Commercial-quality or lower-quality jade jewelry still makes up the bulk of online sales. Consumers prefer to see the jade in person and up close in most cases. Auction houses are an important selling channel for higher-end goods and antiques. 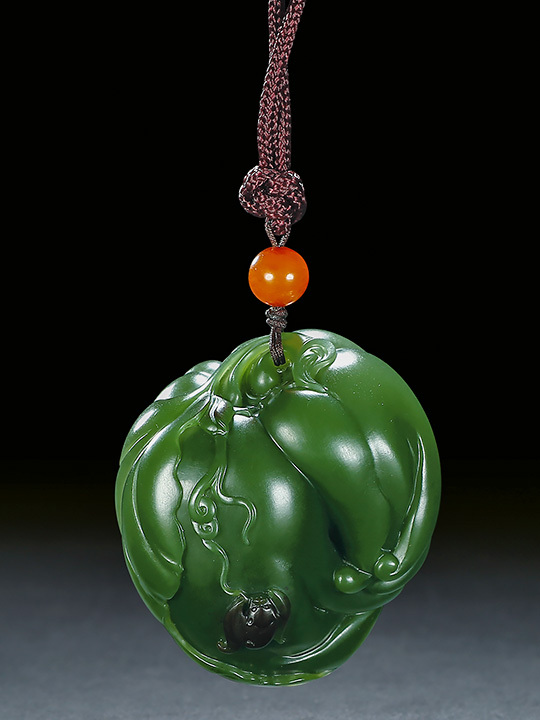 Major auction houses such as Christie’s and Sotheby’s have seen record-setting nephrite jade pieces. Many are antiques, so historic value adds to the value of the material itself. 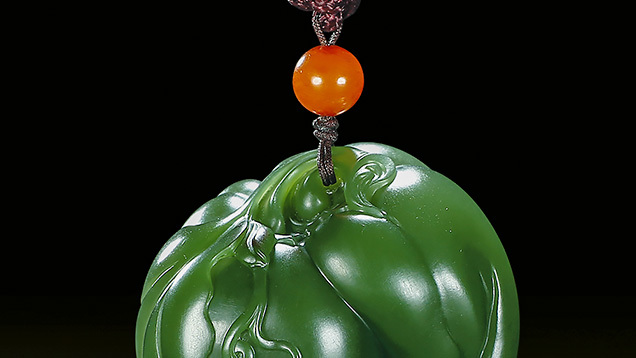 Top-quality and important imperial court-related pieces can compete with the prices of high-end jadeite jade. Besides these major auction houses, there are quite a few others that specialize in modern jade items. This very special selling channel can only be found in China. 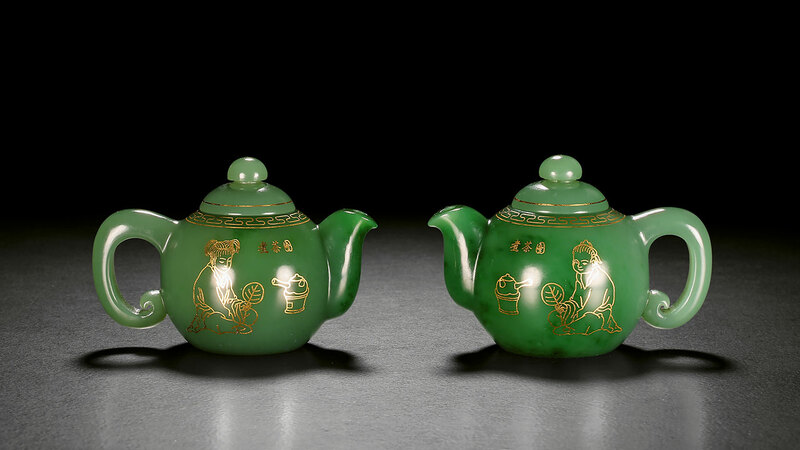 The auction houses cater not only to rich consumers, but also to ordinary consumers and jade collectors. One of those auction houses is Beijing Boguan Auction House. 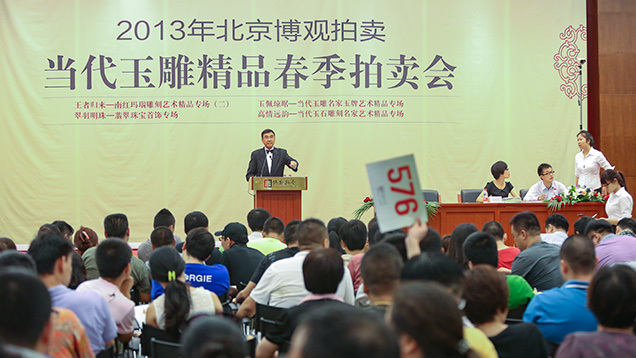 Since its founding in 2006, Boguan has held more than 100 auctions with 28 different themes. Their focus is on modern jade carvings and jewelry. Many of the buyers are collectors at different levels and many are simply jade lovers. The most recent auction, held in Beijing on April 12, 2015, realized total sales of about US$1 million. These auctions provide a platform to connect master carvers with ordinary buyers and collectors. You do not have to be incredibly rich to bid in an auction. 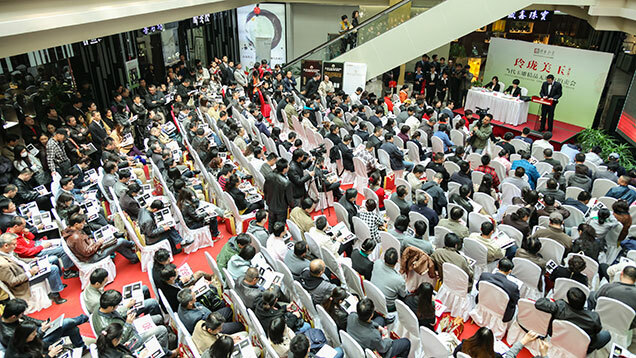 This auction, hosted by Beijing Boguan Auction House, was held on the ground floor of a big shopping mall in Beijing. Buyers are very passionate about this type of auction. Courtesy Beijing Boguan Auction House. 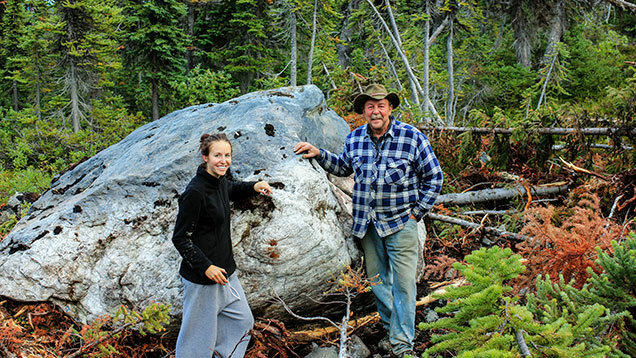 Kirk Makepeace predicts a promising future for nephrite mining in British Columbia. His nephrite business involves his entire family. The most important factor, in his opinion, is the growing appreciation for nephrite and the growing desire to keep rough prices high enough to offset the increasing cost of mining. Although environmental regulations for mining gemstones are getting stricter he does not see them as a challenge for his operation. On the other side of the globe, the Chinese government also places strict regulations on mining nephrite to keep the resource sustainable and the mines environmentally friendly. 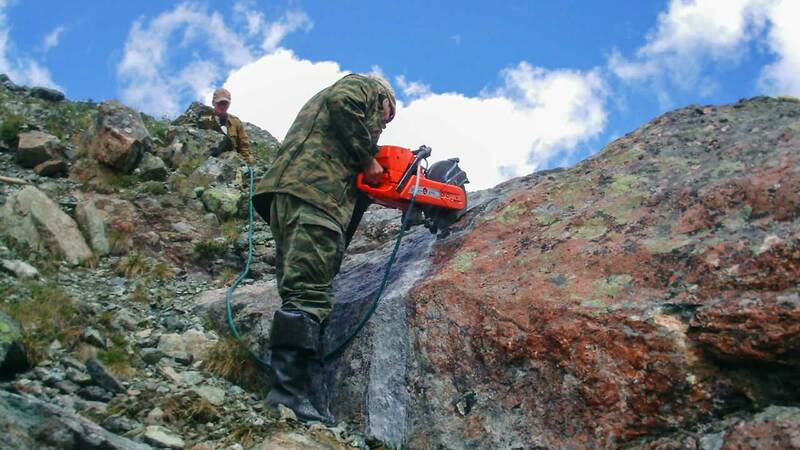 Siberian miners also realize the economic value of their nephrite resources and have already started to stabilize production, trying to get the best benefit for local development. However, the bureaucratic requirements are increasingly time-consuming and expensive. Costs of labor, fuel, and transportation are also constantly on the rise. These are the problems that all source areas are facing. 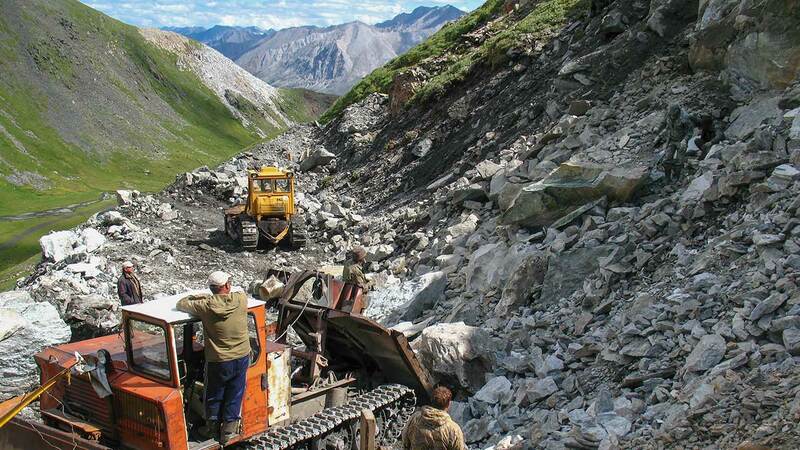 The rise in revenue from mining nephrite must continue as operations go deeper into the mountains. Nephrite jade has been appreciated in the Orient, especially China, for thousands of years. Many people are working hard to preserve jade culture and to pass it on to future generations. To support this heritage, a stable supply is necessary. For this reason, limited production of nice green nephrite has forced the Chinese market to move past its traditions and embrace supplies from Canada and Russia. 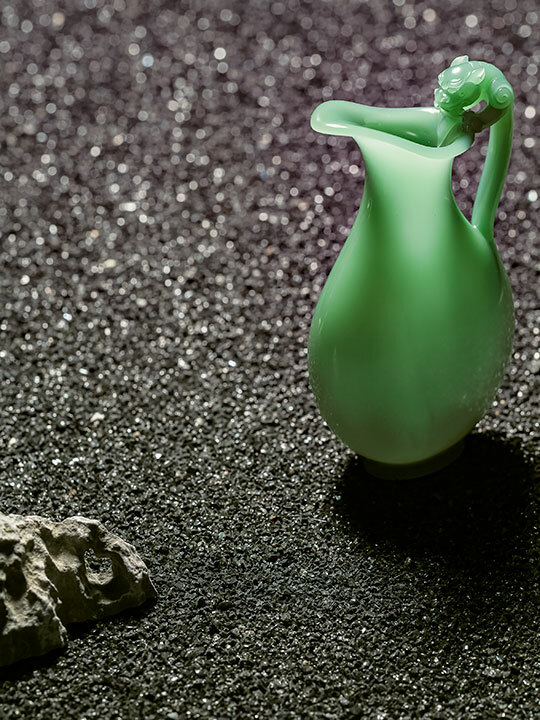 At the same time, the quality of imported green nephrite has gradually given those sources their own growing reputations, winning consumers over. Chinese investors also go all over the globe to find new resources to fulfill domestic demand. With overseas materials coming in and Chinese material going out, the jade road formed over the past three decades will be well maintained and further developed as the Chinese market keeps growing. Dr. Tao Hsu is a Technical Editor of Gems & Gemology and a Research Specialist at GIA Carlsbad. Mr. Andrew Lucas is the Manager of Field Gemology at GIA Carlsbad. Mr. Kirk Makepeace and Ms. Nikki Makepeace are the president and sales manager of the Jade West Group. The authors greatly appreciate the help provided by the following trade contacts: Athena Chen from China Gems magazine, Dr. Sasha Sekerin from Russia, Prof. Wu Ruihua from China University of Geosciences (Beijing), Mr. Ao Yan from Beijing Boguan Auction House, and Mr. Zhang Jinghong from Jade Factory and Jade Mountain. The images and advice provided by all of them gave us the basis for developing this article. Join a GIA team on a visit to the bustling jadeite trading centers of Guangdong Province, China. You'll observe a market understood by few Westerners, as industry leaders explain the intricate details of a gemstone that's also an integral part of the culture. During an expedition to China, a GIA team was introduced to the largest jadeite boulder being carved. This amazing blend of nature’s beauty and man’s artistry is an ongoing project to which master artists have devoted years of their lives. Enter the world of high-end jadeite and discover the connection between this stone and the Chinese culture while visiting the Zhaoyi retail salon in Beijing. 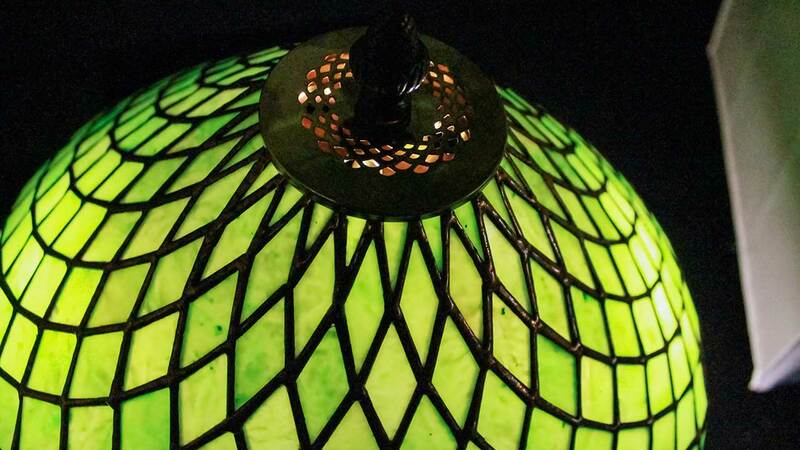 Explore jade history, research, quality factors, and more in the GIA Gem Encyclopedia.